Kickstarter project for eBook and photo book now LIVE! Been following along with Peter’s Wanderings? 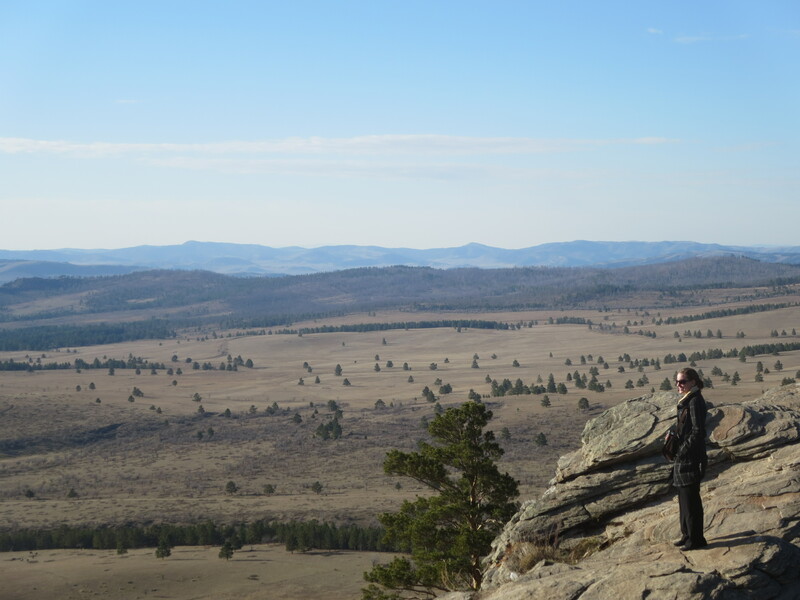 Interested in learning more about Mongolia? 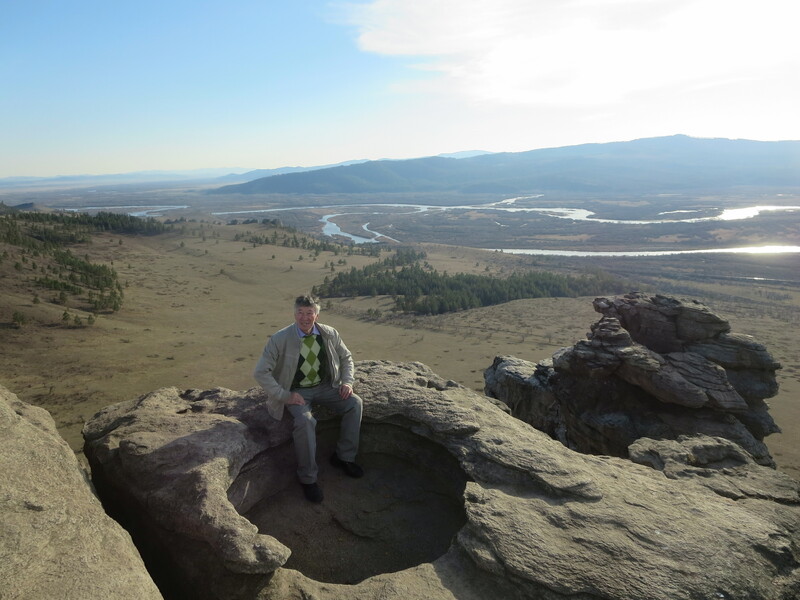 Share in my Mongolian adventures through my exclusive eBook and photo book! Check out my new Kickstarter page to reserve your copy and see other great rewards! I can’t do this by myself! For more information and project updates check out the top bar of my webpage next to the “About” section! A view from the hills of Zaisan! Being an Outsider and Bridging the Gap! 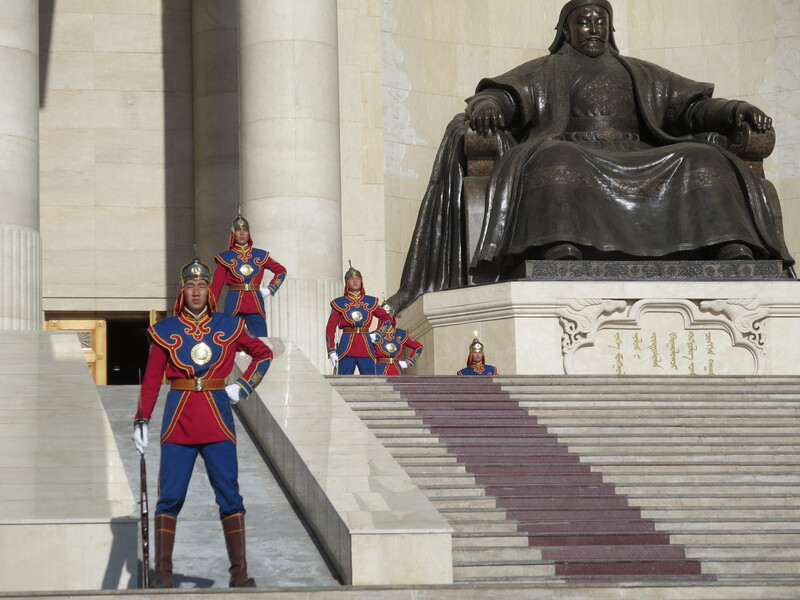 As a white male living in Mongolia, I stand out considerably in a crowd. 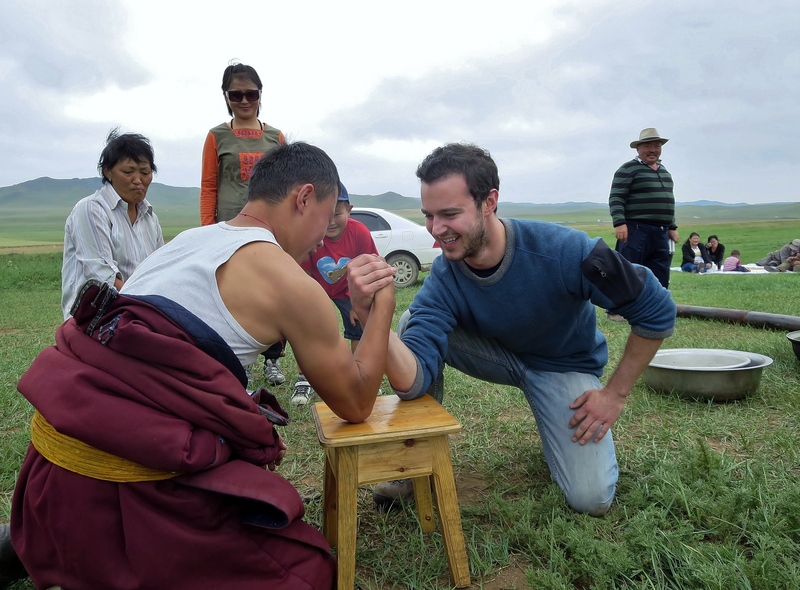 My pasty skin, dark reddish beard, and long, prominent nose clearly set me apart from ethnic Mongols – which make up nearly 95% of all Mongolians. As an obvious outsider, I receive a wide range of reactions from locals when I’m out in public. “Hello teacher!” “Hi teacher!” “How are you, teacher?” Female students swarm around me in my university lobby, blocking the hallway back to the office. After spotting me taking photos of the “New Year’s Tree” in the main entryway, a dozen teenagers quickly corner me. Grabbing me by the arm they position me in front of the evergreen. “Here, teacher!” FLASH! The tinsel-covered pine behind us illuminates the entire room. I can’t even see the green needles beneath metallic streamers. First, the students take individual iPhone photos with me. I feel as much of a prop as the balloons and streamers hanging down from the ceiling. 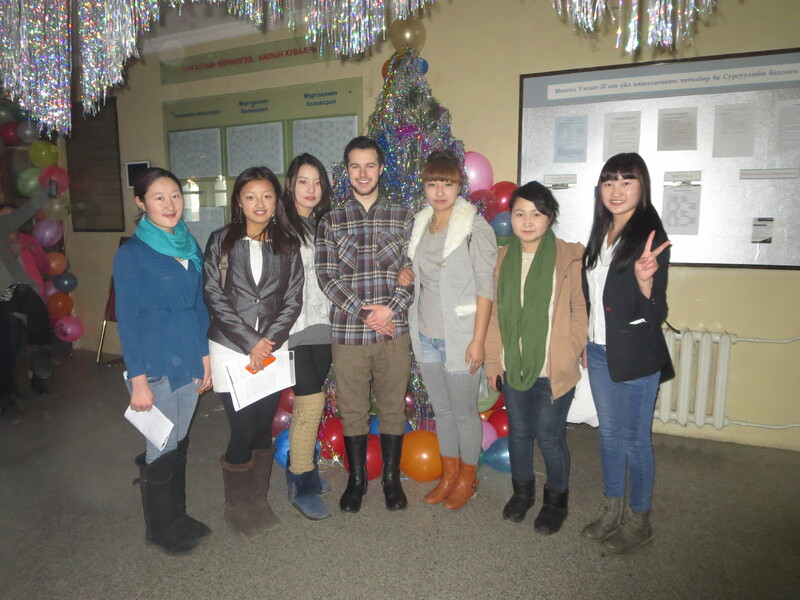 Next, they snap pictures with two or three students on either side of me and, finally, we take several group shots. I smile and wait patiently for the students to finish the photo shoot so I can escape. Meanwhile, the security guard at the front entrance chuckles at the spectacle. He jabs his coworker peering out the window. The second man turns around and begins laughing too. 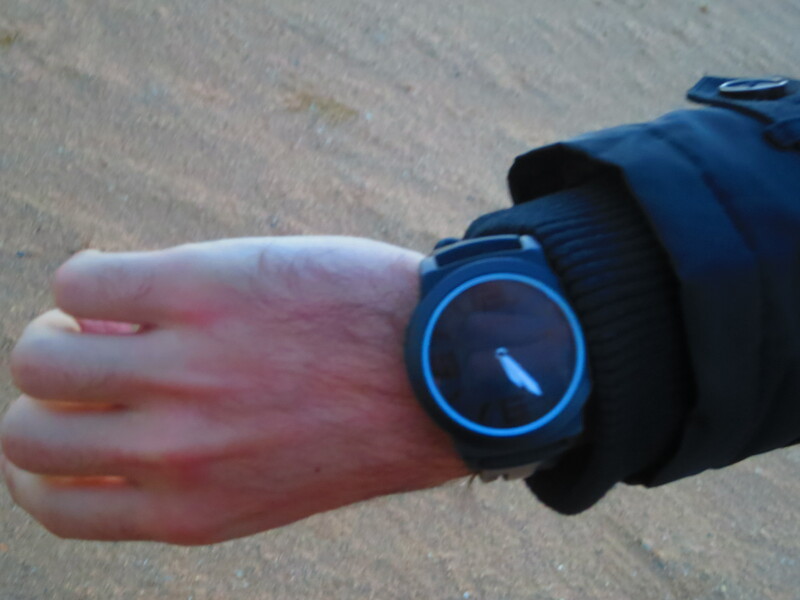 Later in the day, I prepare for the thirty minute walk to my friend’s apartment across Ulaanbaatar. After putting on my long underwear, wool socks and pants, flannel shirt, leather gloves, fur-lined boots, parka, and neoprene pollution mask, I set off. Carrying two large bags full of groceries for dinner; I prep myself mentally for the grueling walk. Open manhole covers, sidewalks piled high with sand and rubble, live wires, hidden patches of black ice, and reckless drivers; walking across the city is always an obstacle course! After twenty minutes my arms are burning and I’m getting tired from navigating the uneven and slick footing. The condensation from my breath is freezing on the outside of my pollution mask. My eyelids stick together as my frosty lashes latch like Velcro. I bat my eyes quickly to free them. Grunting, I pick up the pace. I squint against the wind as a group of students walks towards me, five abreast. As I step aside to let them pass on the narrow sidewalk a male teenager leaps at me. He yells something in Mongolian. Suddenly, he swings his open hand inches from my face, turning and smiling to his friends at his demonstration of bravado. I let the unruly youth finish with his antics and continue walking without a word. My daily walk! A better-than-average day during peak pollution season here. 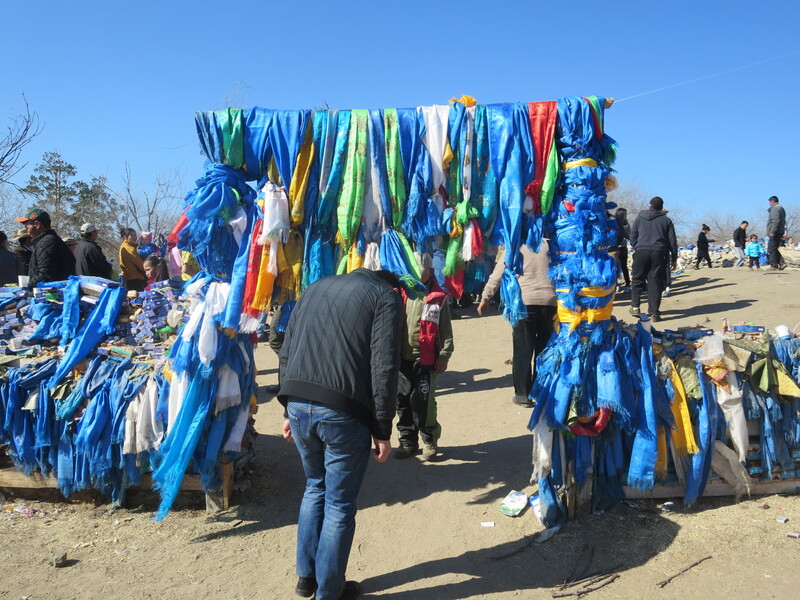 Whatever type of response I illicit from Mongolians as I go about my daily life in Ulaanbaatar, I try to view the behaviors as surface ripples of deeper social undercurrents and not take things too personally. In the United States, as much as progressive forces have educated our citizenry about media-driven misconceptions of what it means to be a white male, a black woman, or an Asian child, racial stereotypes still influence behavior. 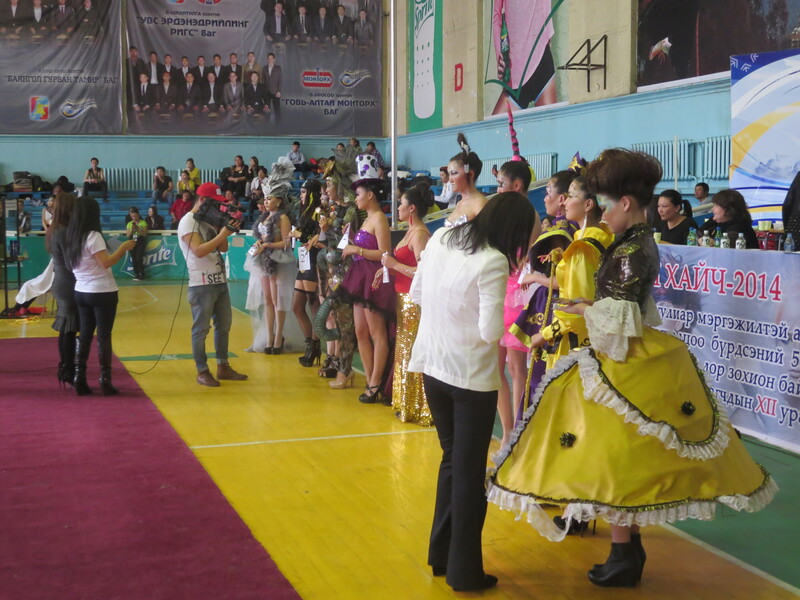 However, in my experience in Mongolia these misinformed overgeneralizations are stronger and more pervasive. Many are treated as fact by large portions of the populace, especially in regards to foreigners. For example, many Mongolians assume that white males are incredibly rich. When I eat with my Mongolian friends at locally-owned restaurants other patrons are sometimes shocked to see me. “They’re saying how poor you must be to eat here” my friend told me, interpreting the flurry of conversations that erupt around us as we sit down at a table. While I experience the consequences of certain strong assumptions about what it means to be white and male, I will be the first to argue that Mongolians are not racist. While many Americans would be inclined to believe the opposite, I think that it’s simplistic, counterproductive, and even racist to frame the issue in terms so terse. In seeking to make sense of my daily experiences here I’ve often turned to history for answers. In the 13th century, Genghis Khaan and his progeny conquered most of Eurasia and, unbeknownst to most Westerners, established a rich multi-cultural trading network and largely peaceful empire. The stability created by the Mongolian superpower’s occupation of cities across Europe, the Middle East, and East Asia fostered religious tolerance at a time when the infamous Inquisition was occurring in parts of Europe. 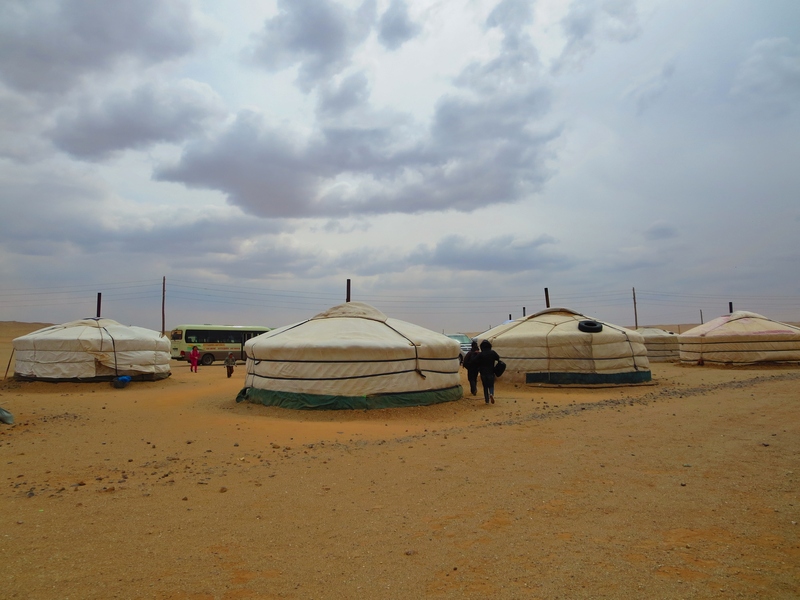 Nonetheless, in the ensuing centuries Mongolia retreated from the world stage and returned to its historical roots as homogenous herders on the steppe. 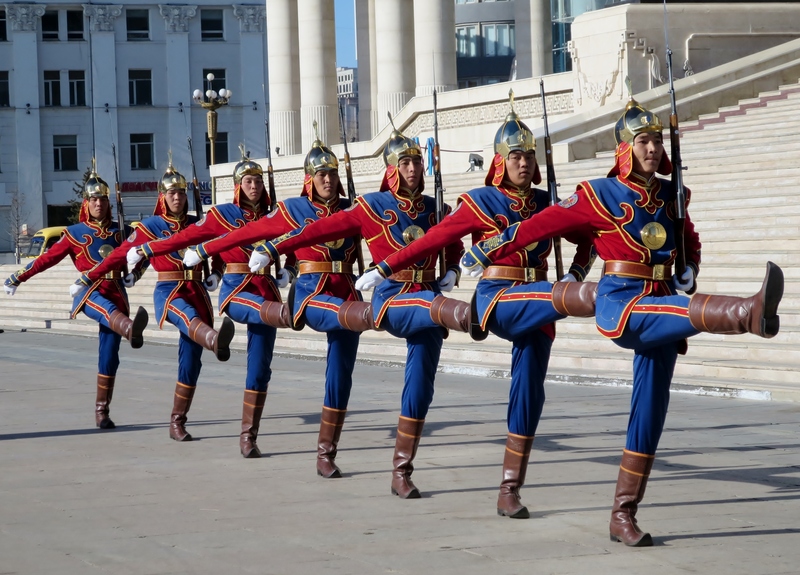 Soldiers practice for Chinggis (Genghis) Khan’s birthday celebration. He’d be over 850 years old! In the early 20th century, a Soviet-backed coup established Mongolia as a de-facto satellite state of the USSR. During the extensive reign, Mongolia’s interactions with nations other than Russia or those of the Soviet bloc were very limited. 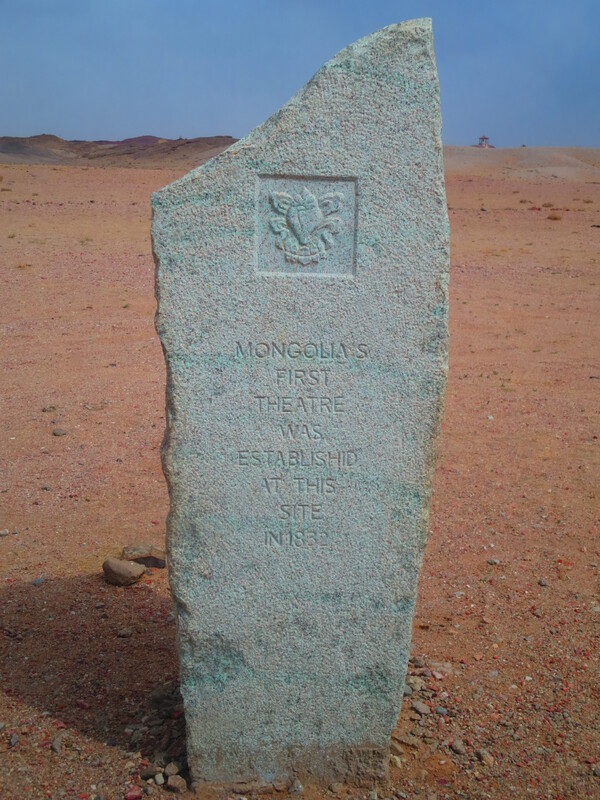 However, in the early 1990s, after the fall of the Berlin Wall, Mongolia underwent a peaceful revolution and abandoned its Soviet political institutions in favor of democratic ones. 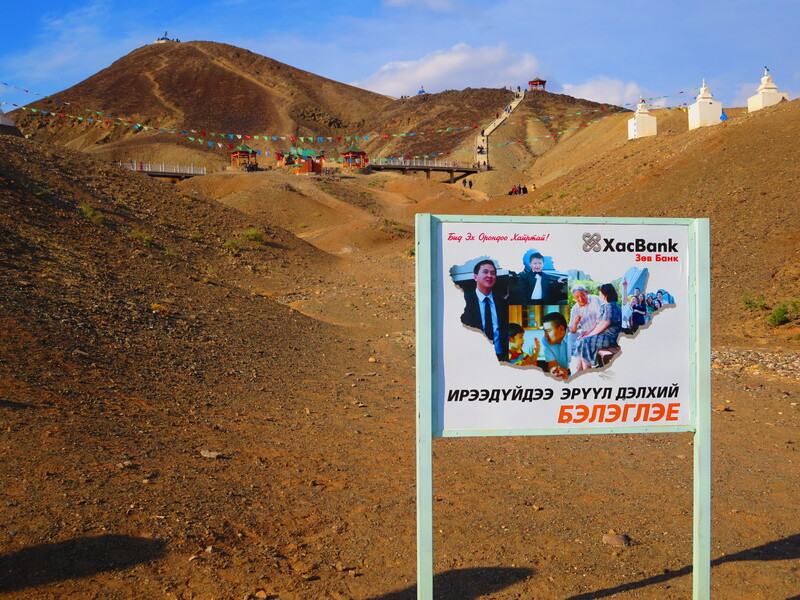 Since this period, Mongolia’s economy has been in a state of great transformation, shifting from a state-controlled economic system to a free-market one. 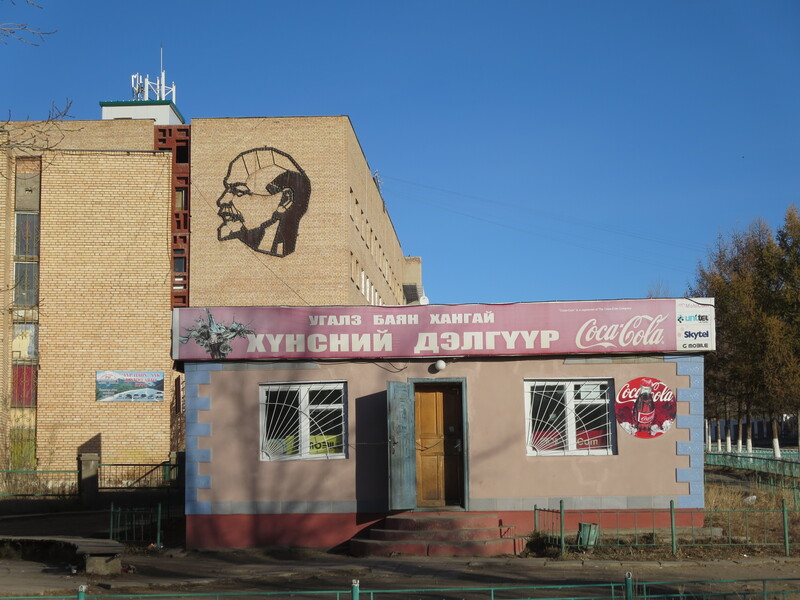 Lenin and Coca Cola in the same frame! Clash of ideologies? As part of much greater economic and political openness, globalizing forces are influencing its society and culture at an unprecedented rate. 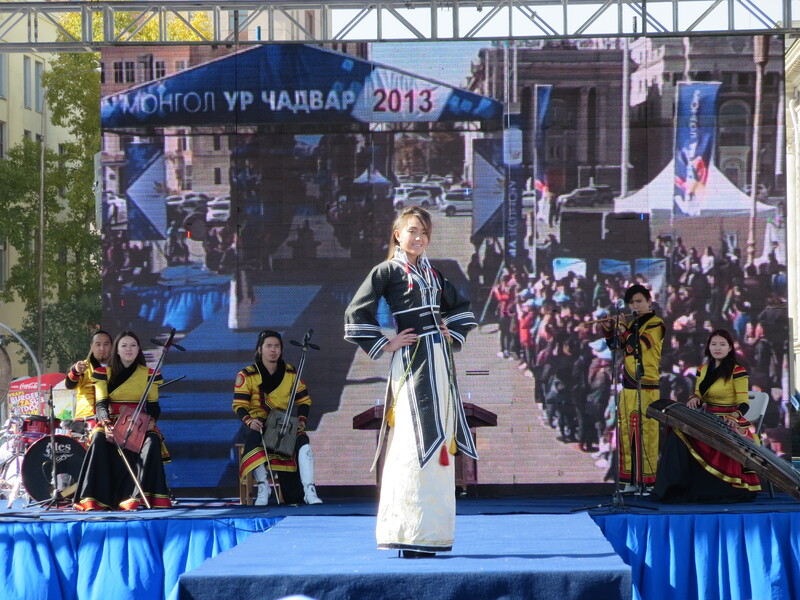 It’s only natural that foreigners are viewed in rather polarizing terms by Mongolians. 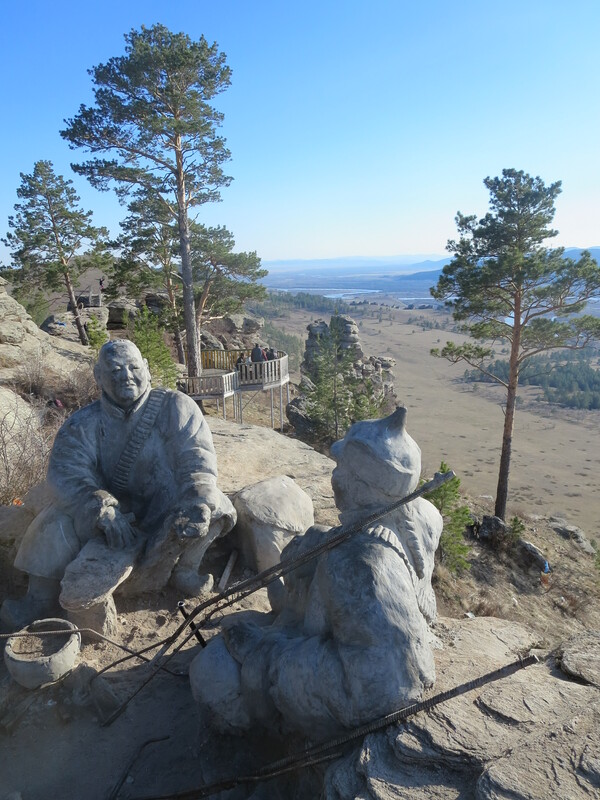 Given Mongolia’s limited recent participation in the modern global political economy it’s not surprising that a number of widely held and poorly-informed beliefs exist about people of different racial backgrounds. 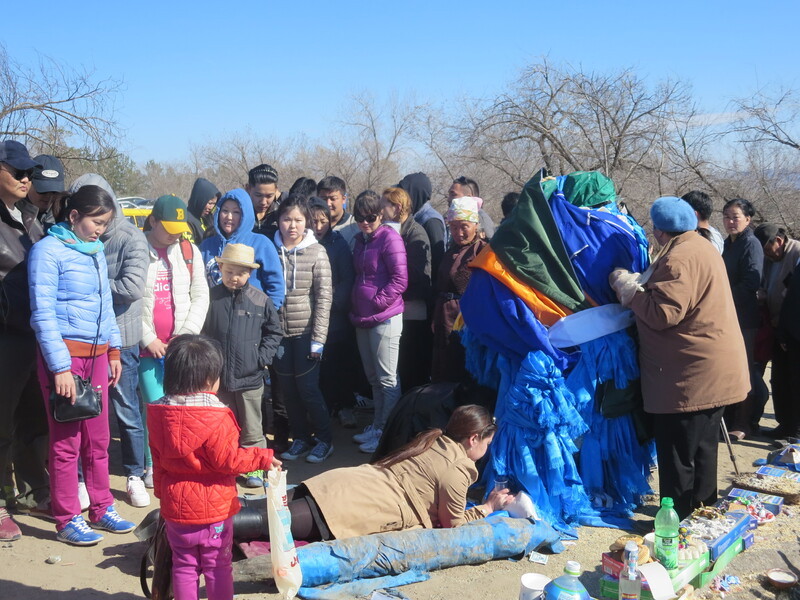 The majority of Mongolians haven’t interacted with foreigners from the diverse cultural, ethnic, and linguistic backgrounds to which they’re suddenly being exposed. So, how do I cope with being an outsider during this momentous cultural shift? How do I deal with constantly feeling like I’m being judged entirely by my appearance or interacted with based on superficial stereotypes? [This also makes me question how it feels to be a minority of any kind in my home country too, although the cultural context is very different from the one in which I’m operating.] It’s tempting at times to try to keep my distance and create a comfort zone removed from unnecessary interactions with Mongolians. However, my experiences with locals have been the most-rewarding and educational ones during my time here! Withdrawing from the culture I’m embedded in is not a healthy or productive option. Engagement is the only viable way forward! Find a language exchange partner! 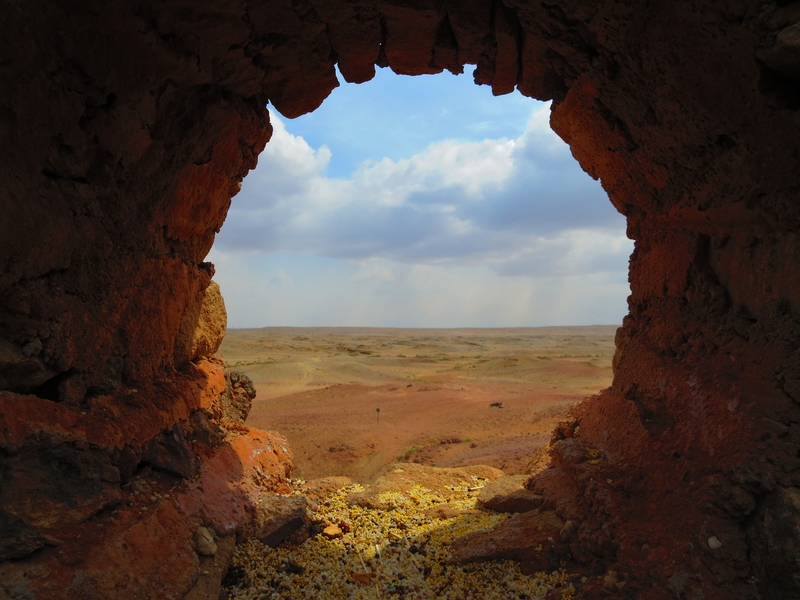 o While learning a new language can be daunting, knowing the basics is essential to interacting with locals on a daily basis and at the very least demonstrates a degree of respect for their culture and language. I’ve never studied an Asian language before and I admit my Mongolian proficiency after nearly six months is very low. Still, coordinating informal Mongolian lessons with a friend interested in improving his English has been very fruitful. Besides learning bare essentials like greetings, numbers, directions, etc. these meetings can be great ways to network and find out about opportunities only locals know about! These meetings have resulted in outings to go hiking, play ping pong, cook regional delicacies and many more opportunities. The world’s greatest picnic spot made possible by my fantastic language-partner, Shine. Get involved in extracurricular activities! o Especially if the language barrier is very difficult to overcome, seeking activities that require little or no language comprehension to communicate or express yourself can be very rewarding. 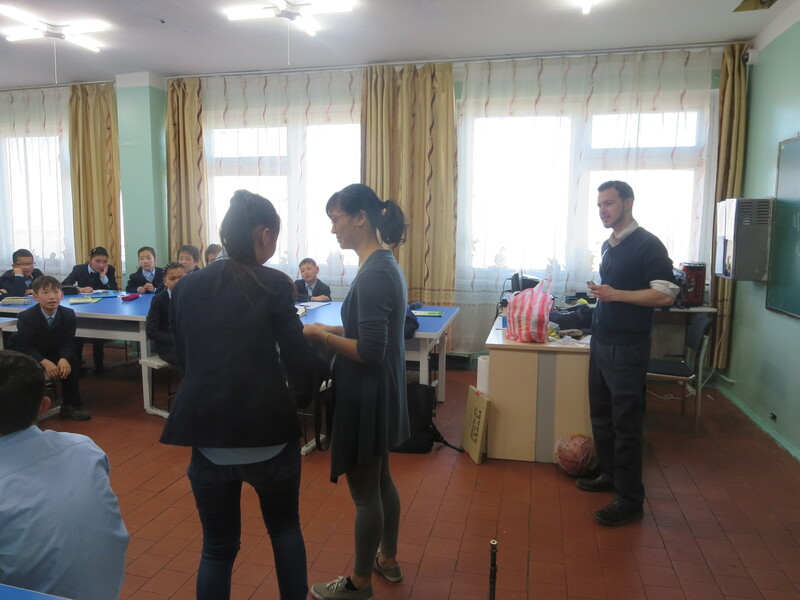 In my free time I’ve played volleyball, billiards, and sang karaoke with Mongolians with varying levels of English proficiency. Team sports are great because they offer good chances to bond with co-workers or peers in an environment where conversation or dialogue isn’t necessary. Take a chance and don’t be afraid to look awkward. You probably already do in the eyes of your hosts and you may show off some hidden talents you didn’t know you had! Try to be patient, flexible, and adaptable! 36 hours later I was performing “Christmas, Baby Please Come Home” on stage to a crowd of well over a hundred people. Terrifying! But, in retrospect it helped me get more comfortable on stage in front of large groups which I’m thankful for. It also helped me gain recognition for my department and status for my co-teachers which is very important culturally. You never know what form chances for engagement will take! 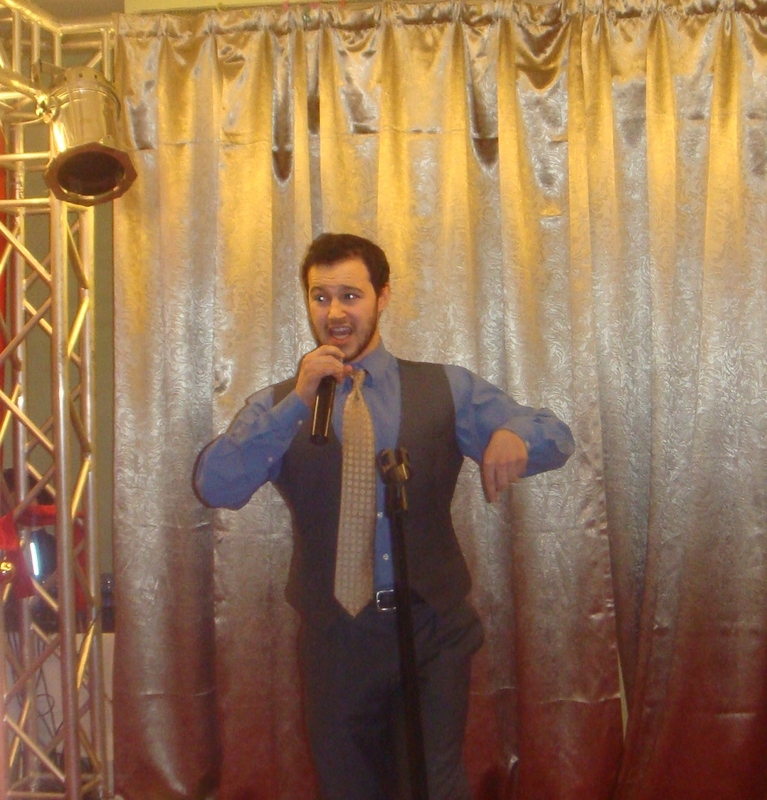 A coworker’s photo of me in (or out) of my element, singing at the New Year’s party in front of hundreds of people — on two days notice! Horses graze at dusk with a rainbow in the background! 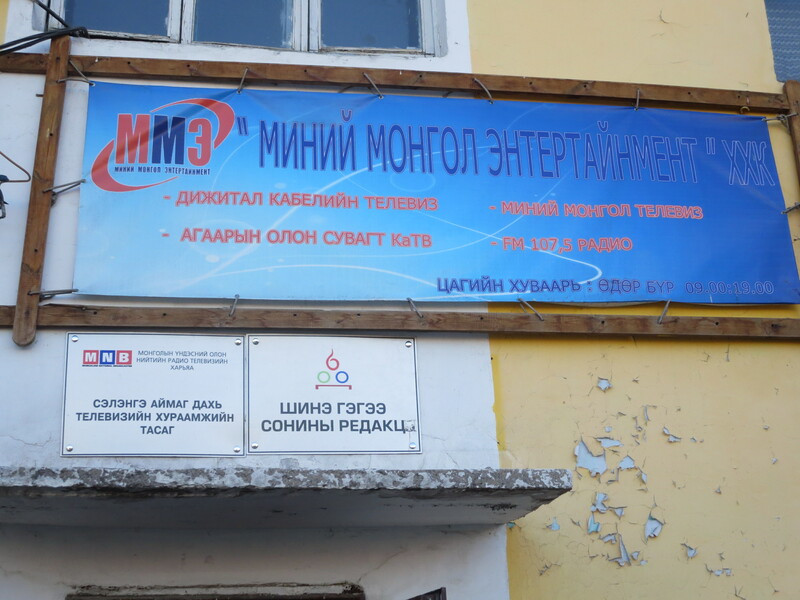 The US Embassy’s Public Affairs Office in Mongolia “conducts educational and cultural exchanges, manages press and information activities, and administers the Embassy website.” While this may sound simple, they go to amazing lengths to engage rural communities on the frontier of diplomacy! In my experience working with them, the PAO staff’s efforts to advertise State Department-sponsored exchange programs, educational resources, and grants for community development projects (among many other initiatives) are extraordinary. 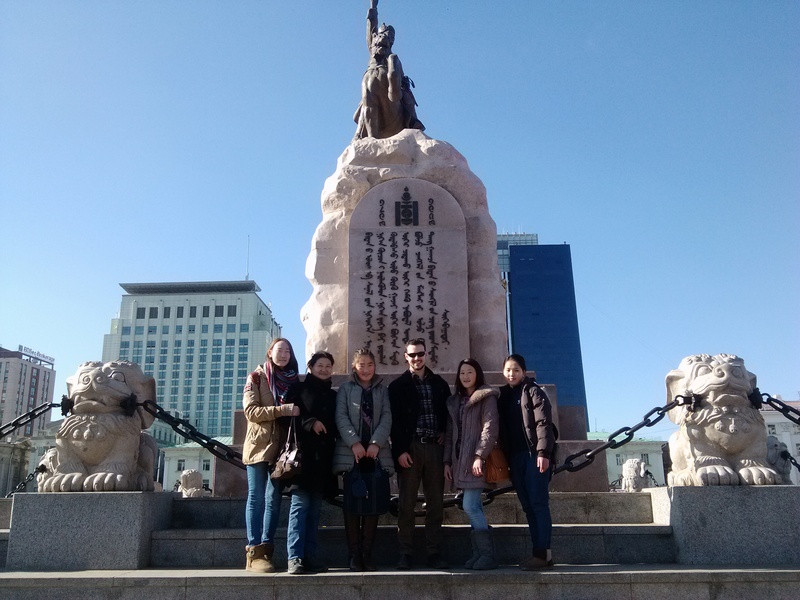 In April of 2014, we Fulbright English Teaching Assistants had the pleasure of accompanying and assisting the US Embassy personnel based in Ulaanbaatar on their most recent outreach trip. 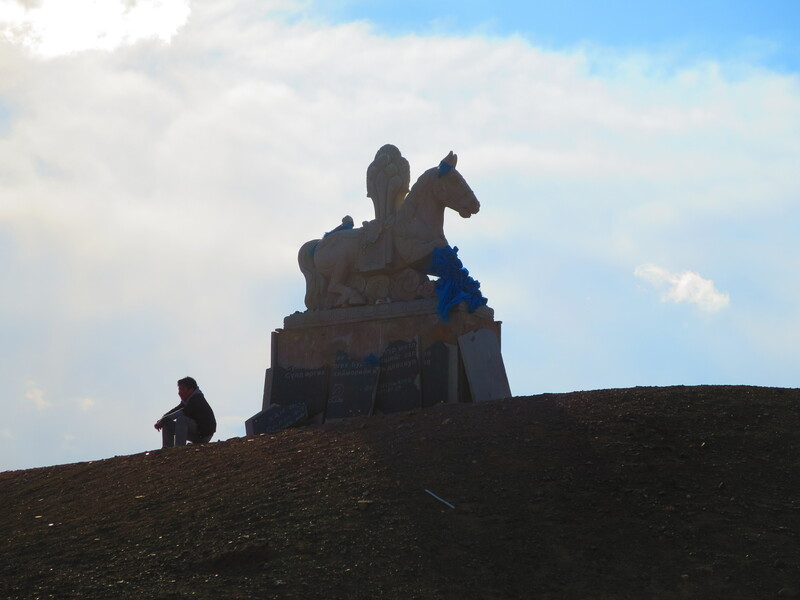 We traveled to Selenge and Hovsgol aimags (northern Mongolian provinces). 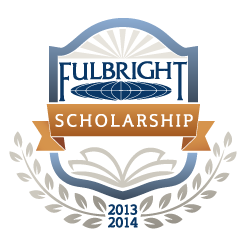 Our PAO/Fulbright group covered over 2,000 kilometers in seven days of official visits, meetings, and press events. 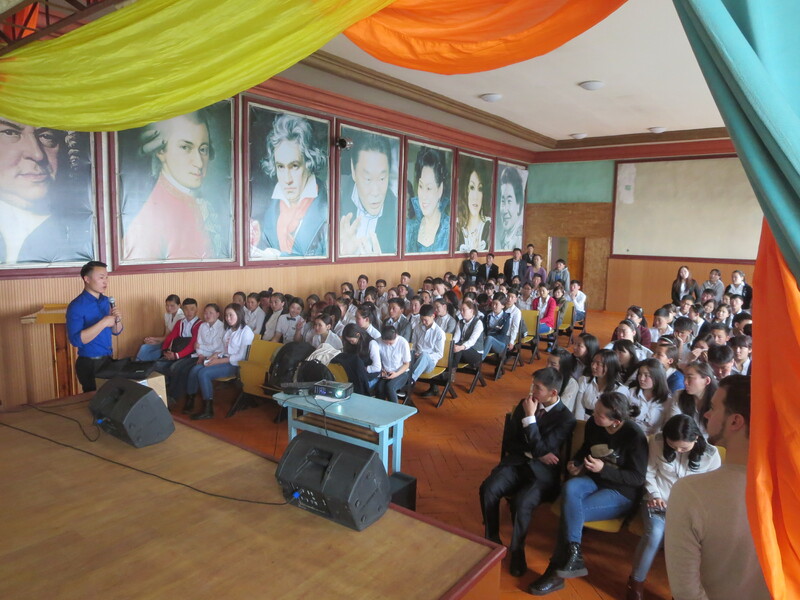 During school visits we Fulbright ETAs lectured about higher education in the United States with the help of translators, led hands-on activities for students, and met with administration officials to discuss possible areas of collaboration. In under-served and underrepresented “soms,” or small rural townships, my colleagues and I were interviewed on national and regional television and radio shows to advertise programs for study and professional development in the United States. 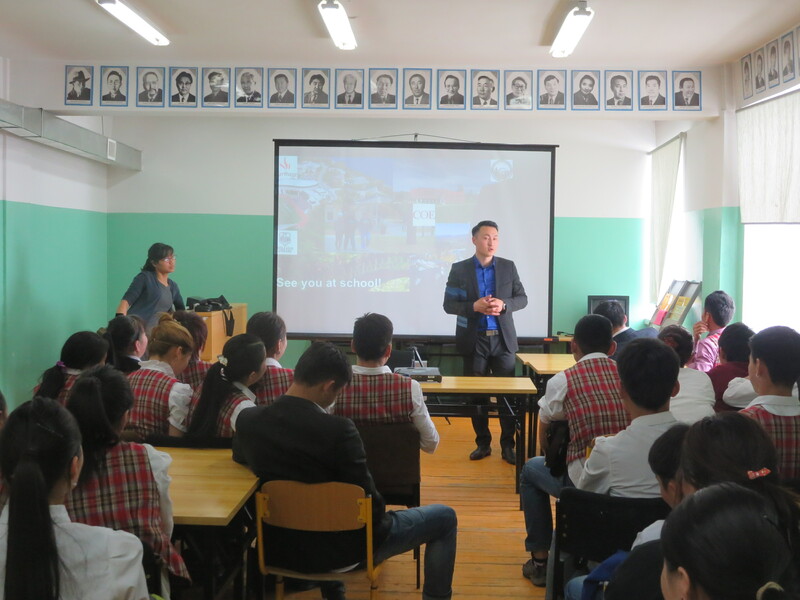 We ETAs assisted with live lectures at public venues for interested Mongolians to find out more about State Department programs. We also met with local government officials and NGO leaders to discuss partnerships and funding opportunities from the US Embassy. It was an intense and rigorous trip but it was a blast! Our group also had fun opportunities to enjoy the local culture, history, and geography where we traveled. Let’s review some of the highlights of the week in photos! 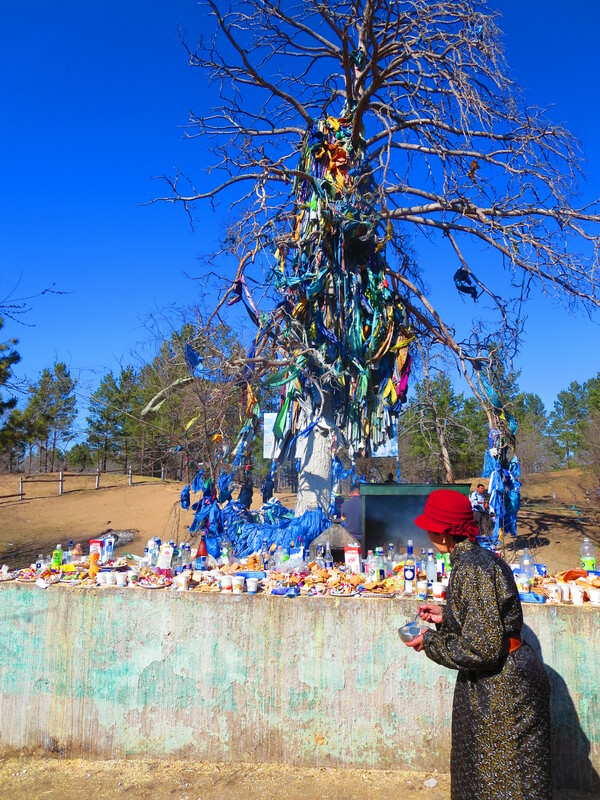 Our first destination along the route was the famous ” Mother Tree.” A popular pilgrimage site, many Mongolians venture a half day trip outside of the capital city to share their secret wishes with the benevolent spirit. In the form of whispers or scribbled notes, they leave their requests at the base of the tree. Walking under the colorful, adorned branches visitors spoon milk, fermented mare’s milk, or vodka into the air towards its tremendous trunk. Others throw rice! Ag Mod, or “Mother Tree.” An elderly woman presents offerings of milk to a large table, hoping the tree will grant her wishes! Incense offerings, ignited and presented in the green shelter, are also given! 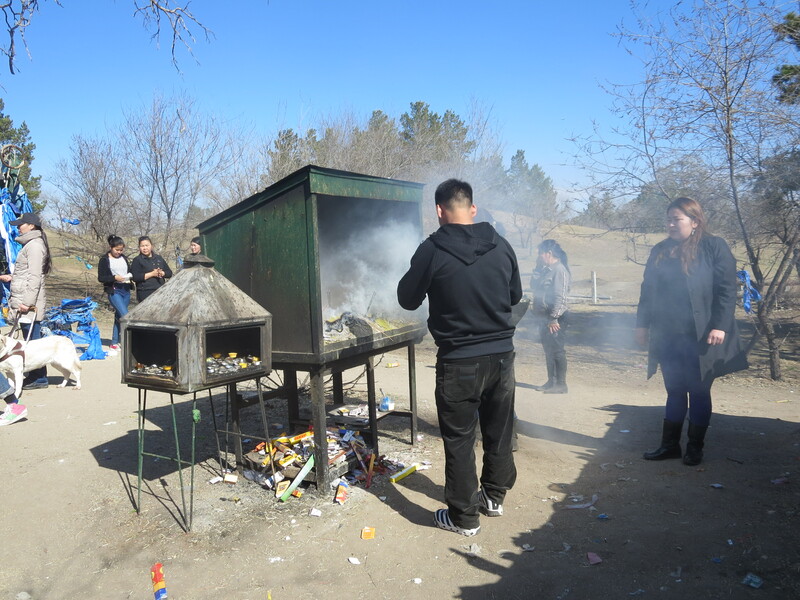 The smoke is believed to be purifying. 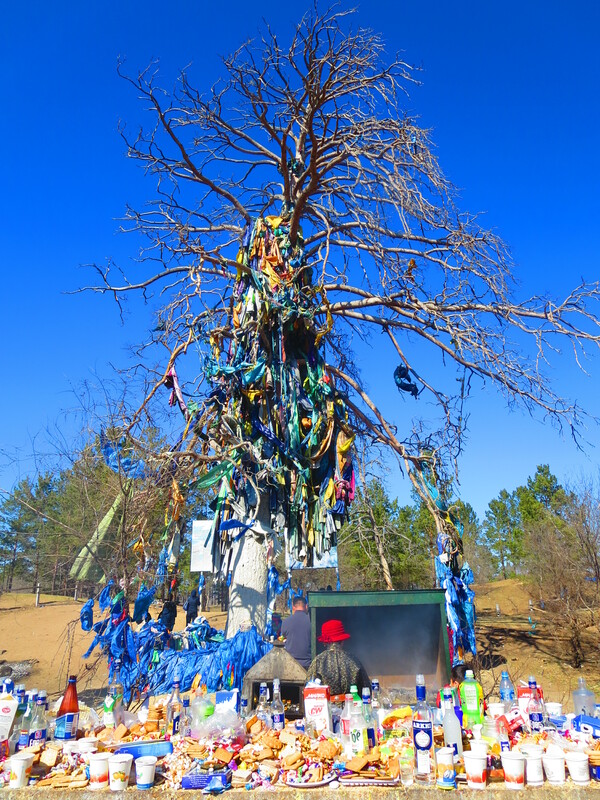 An elaborate shrine covered in prayer flags near the Mother Tree. 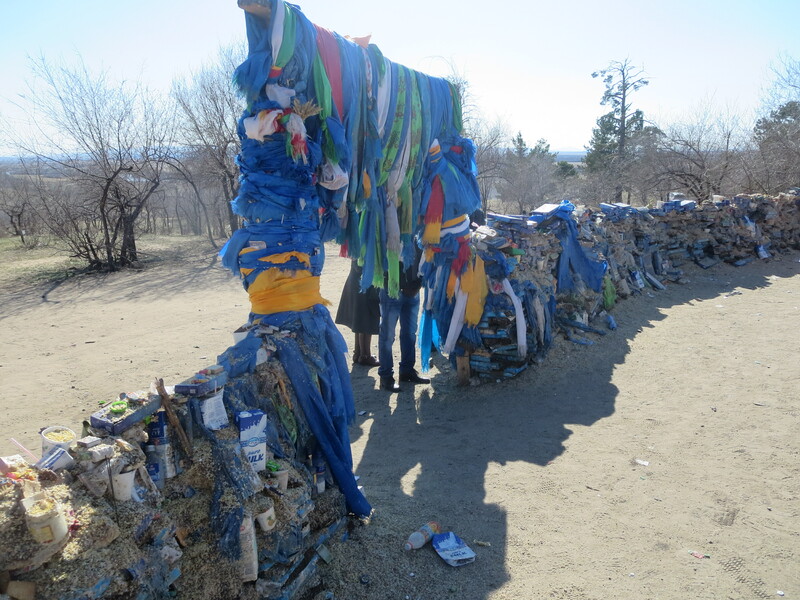 Mongolians walk three times around these “ovoos” and throw rice, milk, vodka, and even rocks on the shrine. 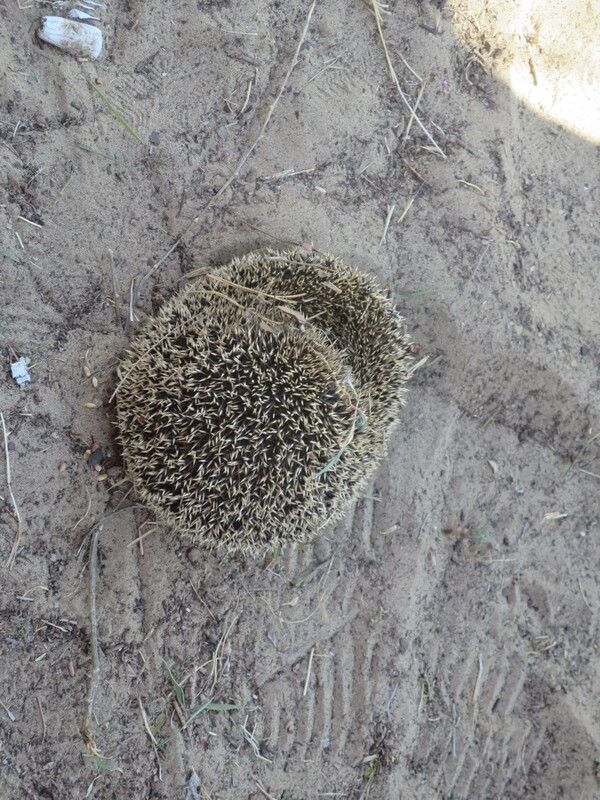 Found near the entrance: a hedgehog! He’s shy in front of the crowd! People are lined up to pay respects to the original (Grand? 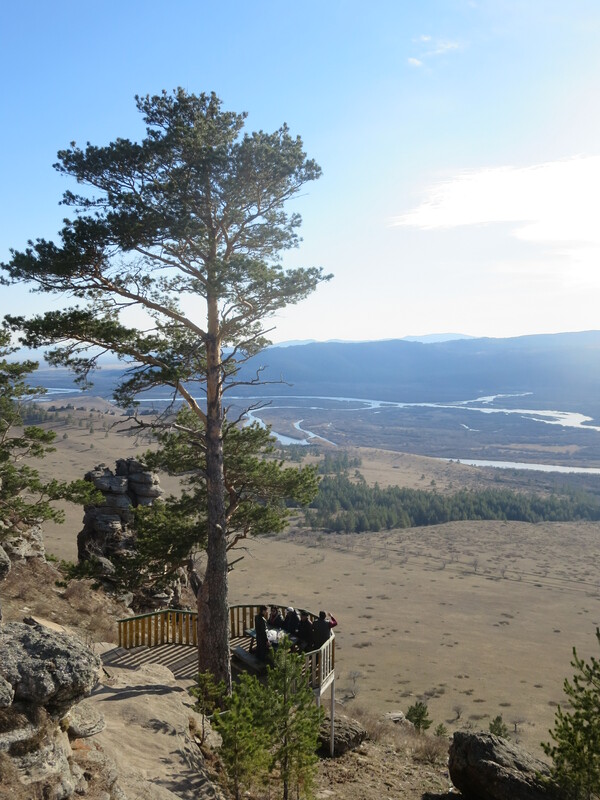 )Mother Tree, that was burned down by the Soviets many years ago. Only the stump remains but it’s even more popular than the current one. To show respect as one leaves he or she is supposed to back out and bow his or her head, like in a Buddhist monastery. In the foreground a woman presents a gift to the elder mother tree while in the background another bows and presses her forehead against the decorated stump. Three generations pay homage to the elder mother tree! 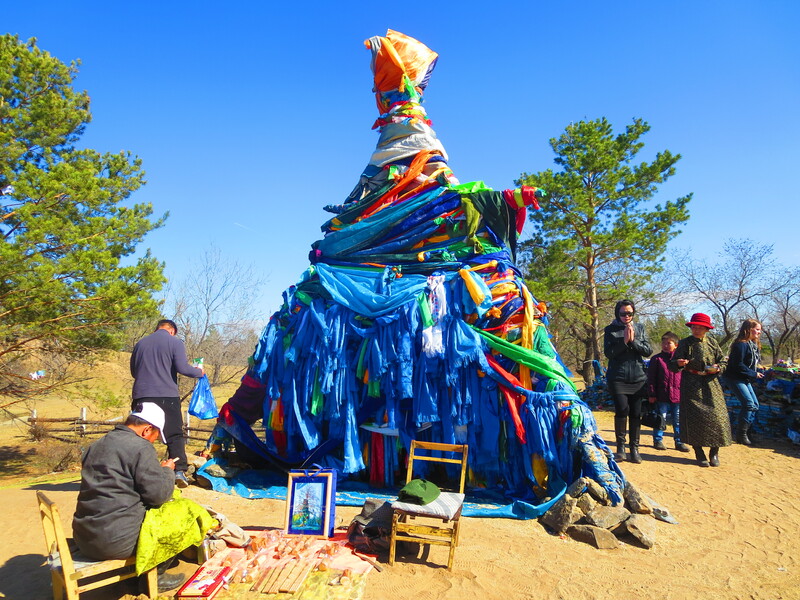 Wearing a herder’s “dell” and several layers of prayer flags, this is probably one of the world’s most popular tree stumps! 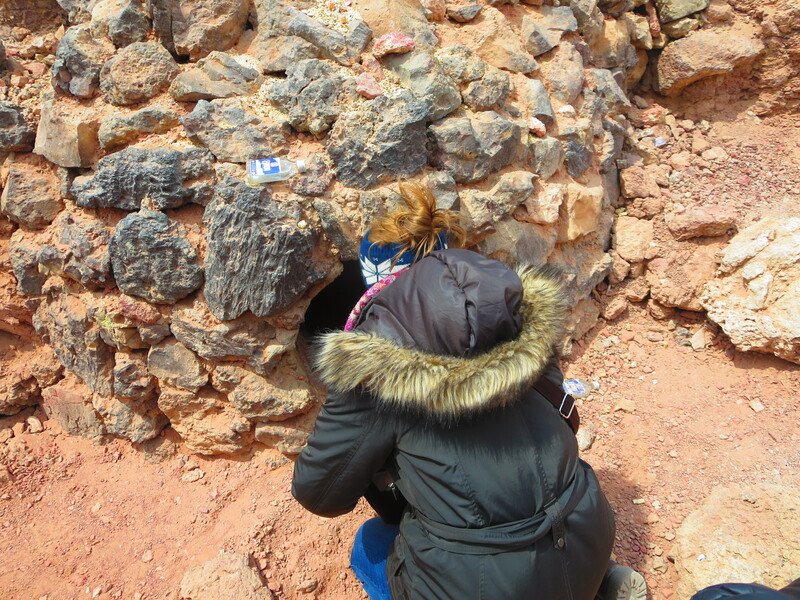 The rock walls of the enclosure are entirely covered in milk bottles, prayer scarves, rice, candies and dried milk. Border patrol officer on his balcony watches as we pull into the parking lot. 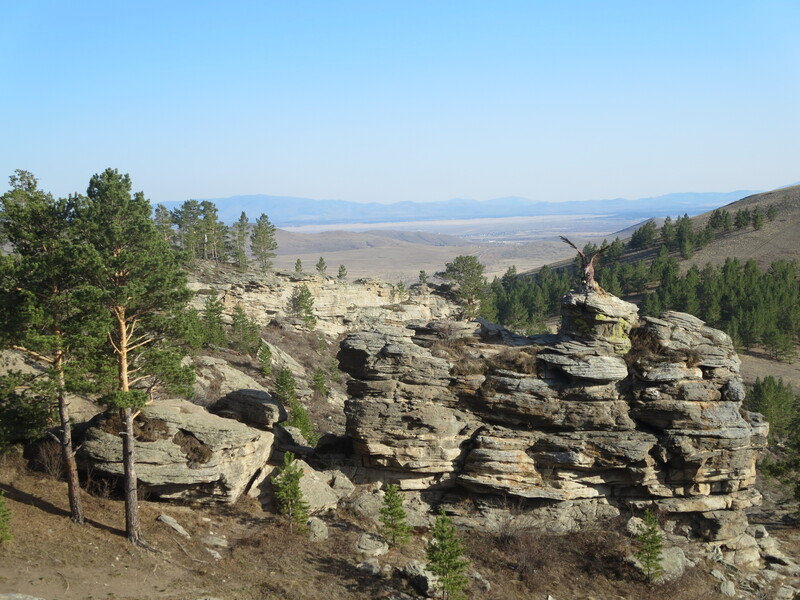 Another far more picturesque balcony overlooks a river valley separating Russian Siberia and Mongolia. Perhaps due to the lack of real soldiers, several statues have been posted to help keep watch. Not a bad place for a hot tub! 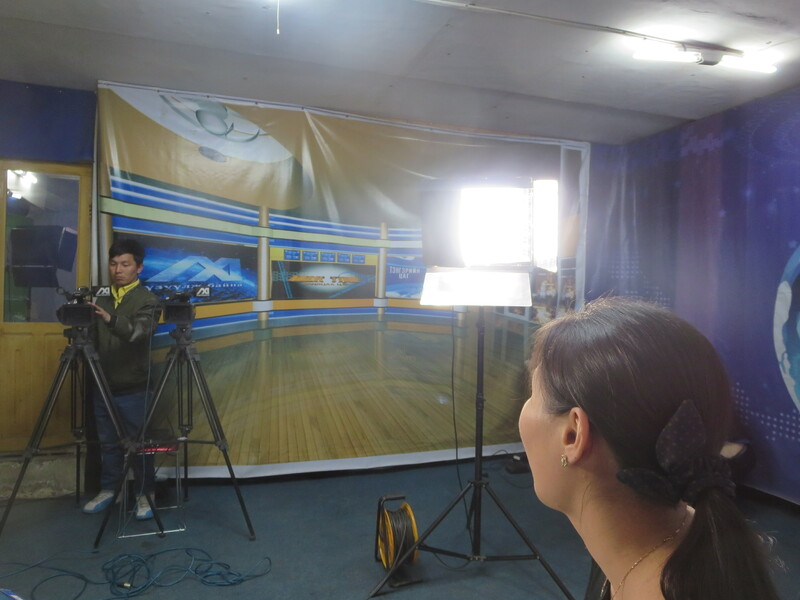 This is where the Fulbright team makes their National TV debut! Prepping for the big interview! 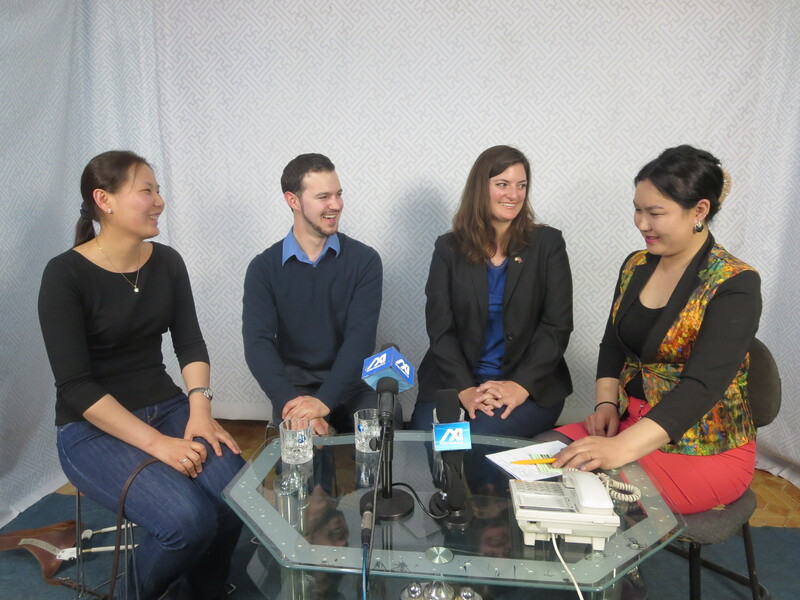 They made a great impression on the viewers and talked about the great scholarships out there available to Mongolians! Live TV interview with my great colleagues! 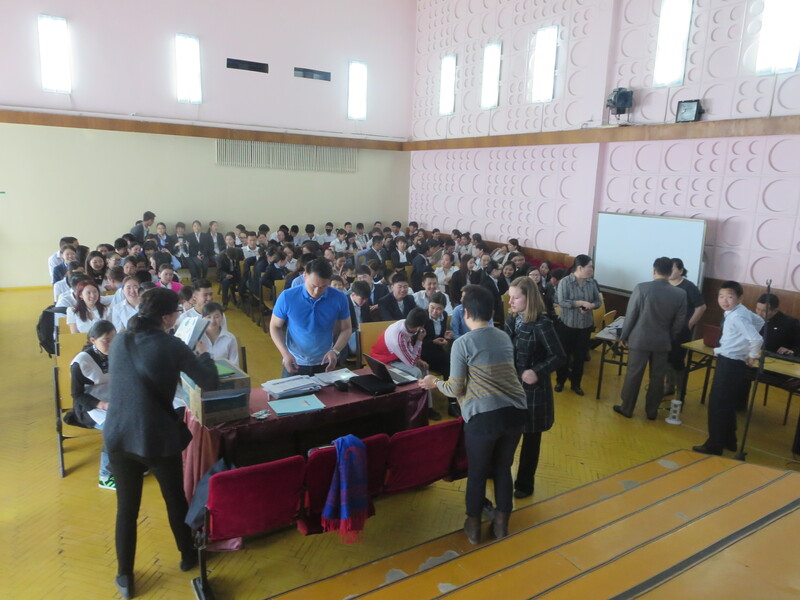 Getting set up to lecture about American colleges and universities to a students audience in Sukhbaatar, Selenge. Leading lessons in classroom for students! Peter and Iderugaan, a State Department alumni, give a lecture in a crowded auditorium. Looking dapper, Ideruugan tells students about his personal story of growing up in a herding family and eventually earning a coveted scholarship to study English in the US. 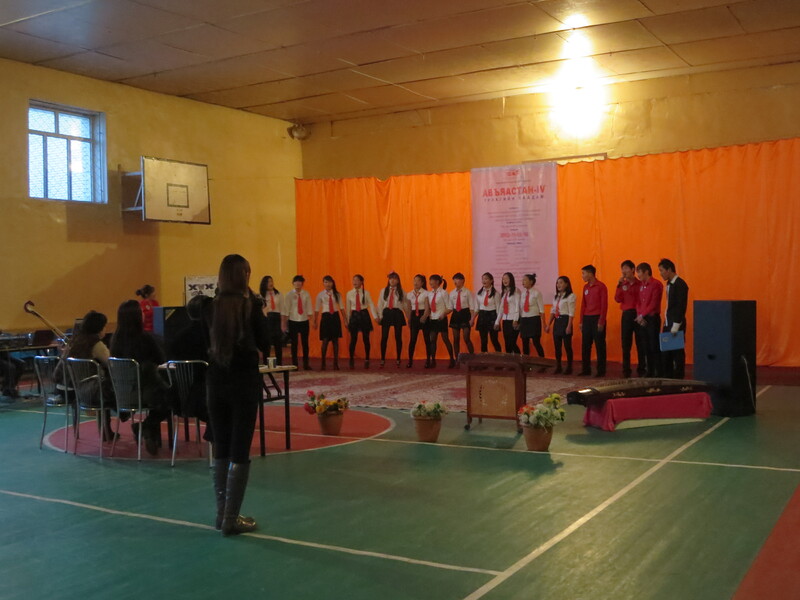 Students paid great attention to what we had to say, hoping for chances to study abroad! Many students asked if it was possible to continue their education at all after high school. Stay tuned for photos from the second half of the trip based in snowy Hovsgol! Here’s a few teasers of what’s to come in the next installment! Horses grazing in the countryside! 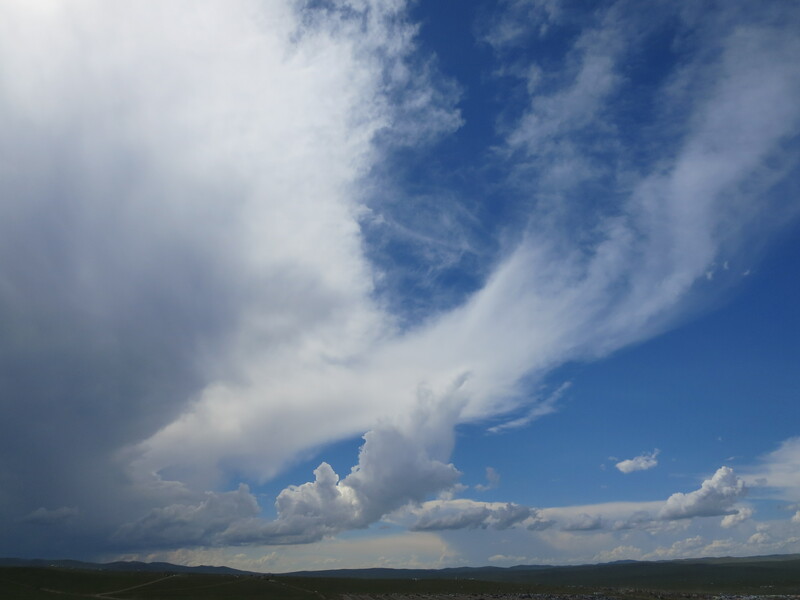 A shot from a car window on an April trip to Hovsgol province in northern Mongolia. 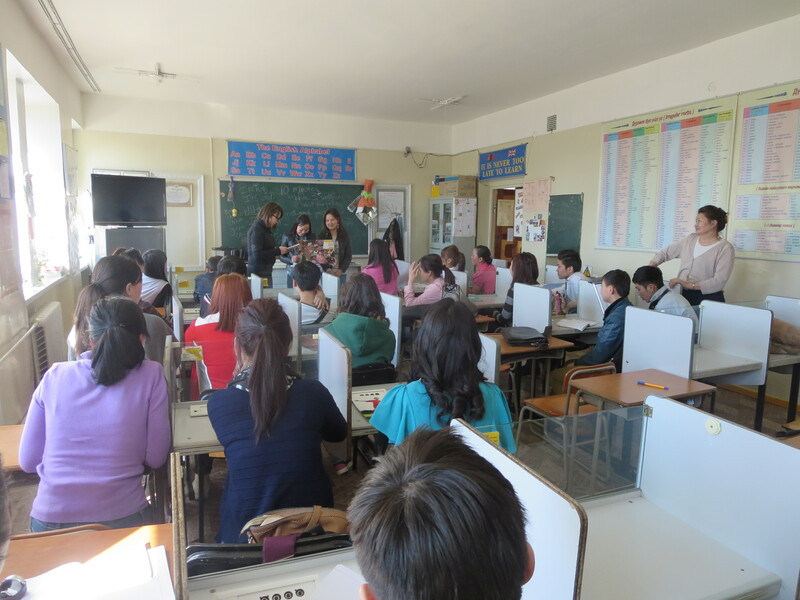 Stay tuned for an upcoming post about the US Embassy-organized outreach trip to visit rural schools! After a nighttime train ride with little sleep, my friends and I arrived at the Sainshand train station around 1 am. (A short stop along the Trans Siberian railroad, the arrival and departure times here aren’t always convenient.) 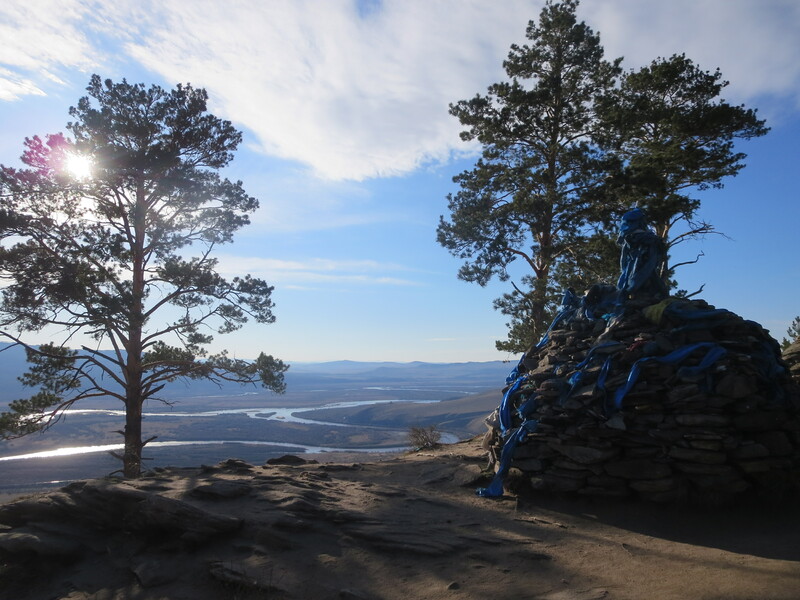 With the help of our Mongolian friends, one of whom also works as a guide, we rendezvoused with our driver. 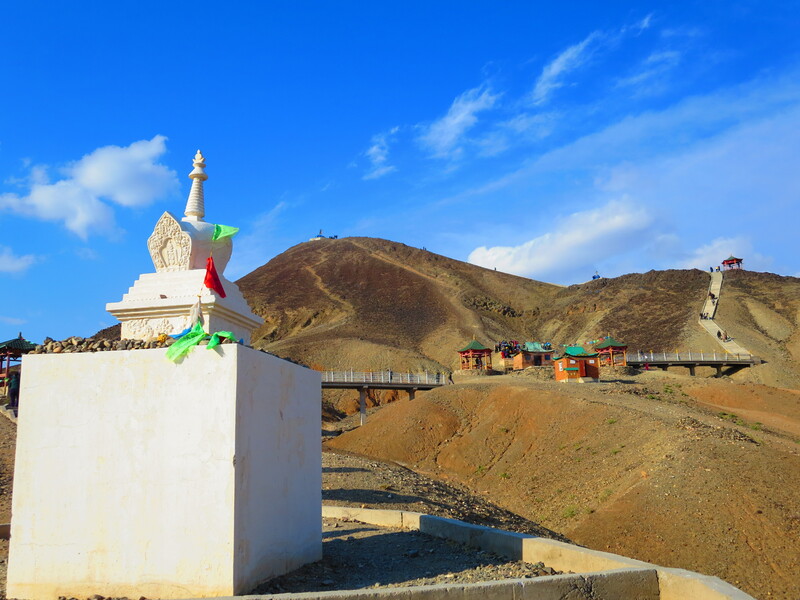 The stout baseball-cap wearing Mongol drove us the roughly 30 kilometers from the capital “city” of Dornogovi province to Khamariin Khiid, a series of restored Buddhist monasteries in the vast desert of the East Gobi. 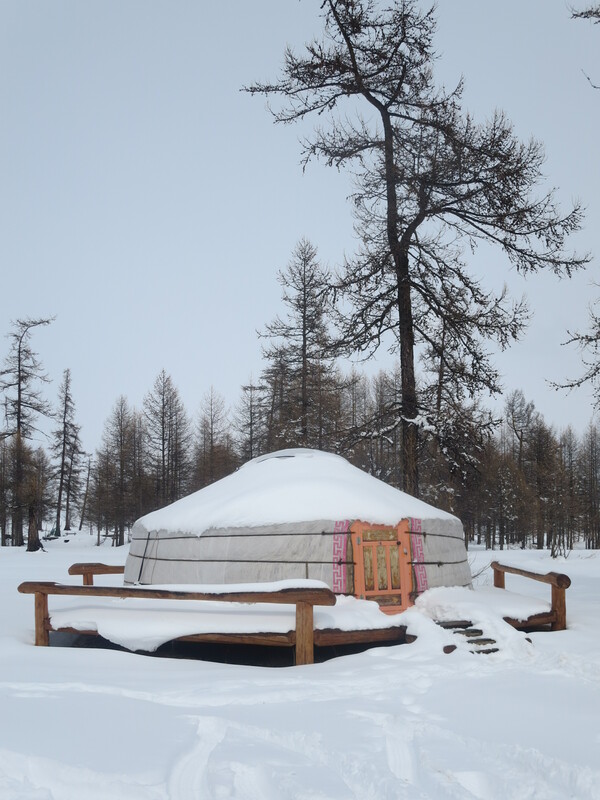 Exhausted from the noisy train ride filled with activity from exuberant children, drunk men, and amorous middle-aged couples in the public berths, we rested for two hours in a toasty ger, or yurt, with a roaring fire in the central stove. We awoke to our alarms just before daybreak and searched for our guide to take us to “wishing mountain” nearby, the must-see spot to see the sunrise. 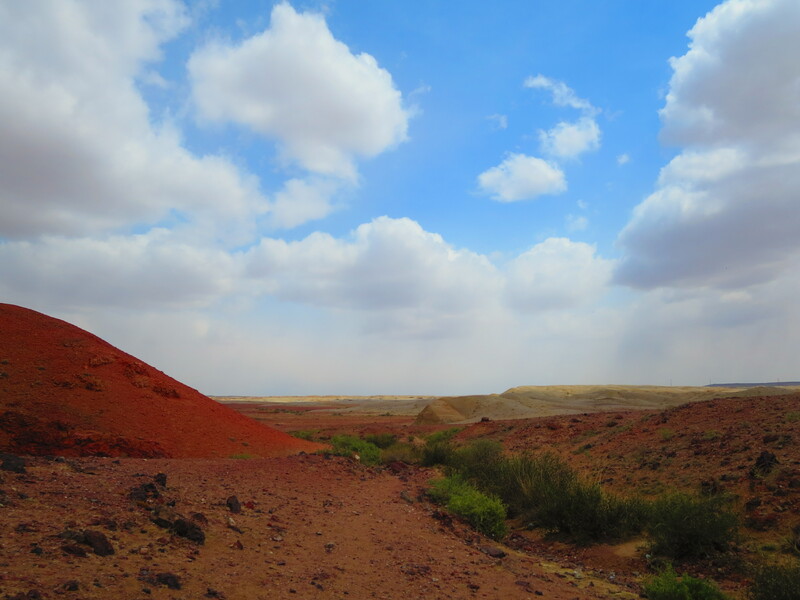 Due to our guide being nowhere in sight and refusing to answer phone calls, we marched out into the freezing windy desert and headed east towards to find our own view. And, slightly disappointed but still cheery, a view we found! 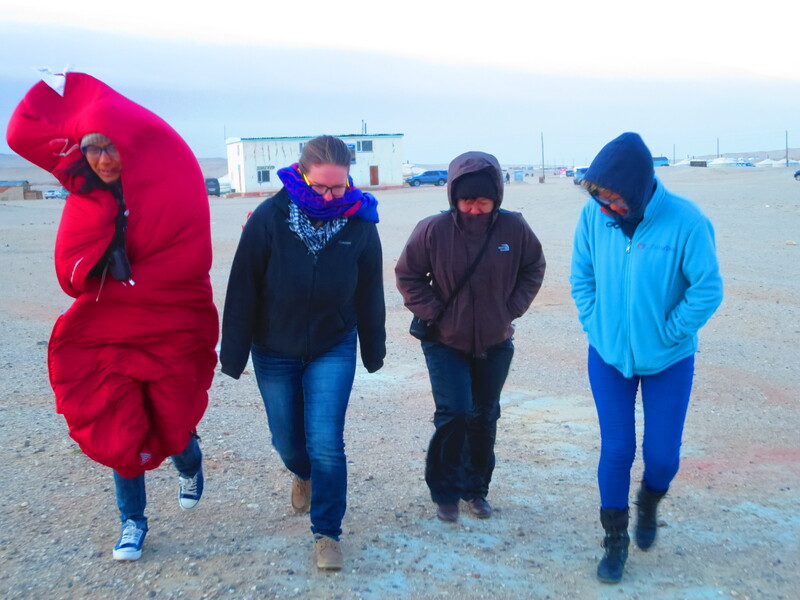 Intrepid sunrise-seekers battle the fierce late-April winds. But worth it! Beautiful lighting. 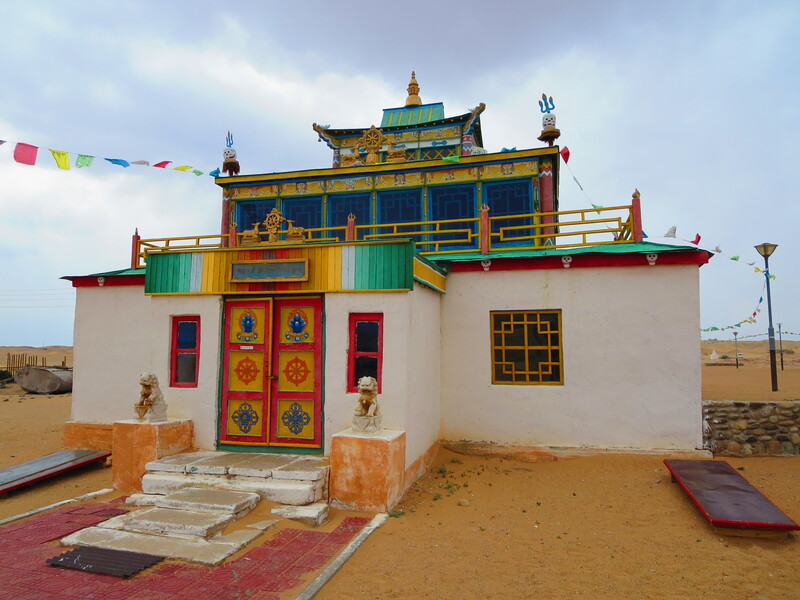 Two restored monasteries in the foreground, with a Buddhist shrine, a stupa, nearby. 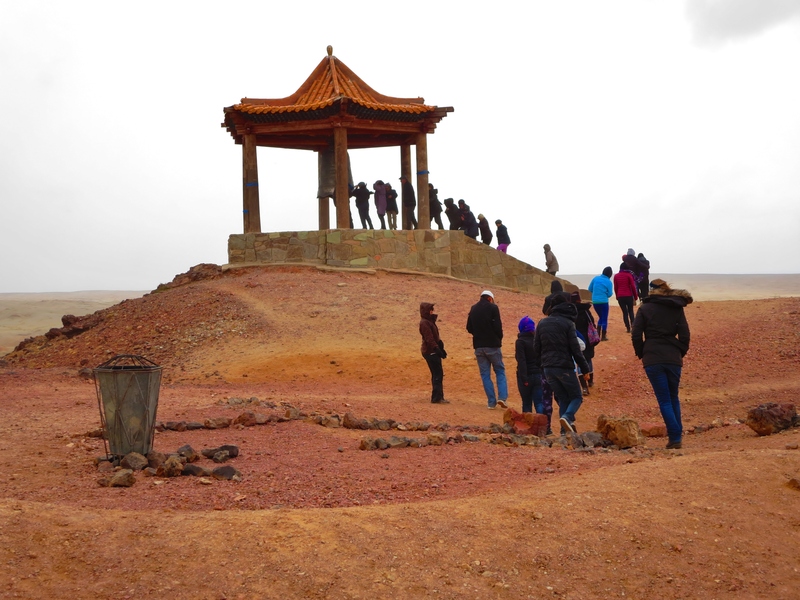 The sight of the first Mongolian theater, planned for reconstruction, and home of famous nineteenth century playwright and lama, Danzanravjaa. However, the tour was worth it! 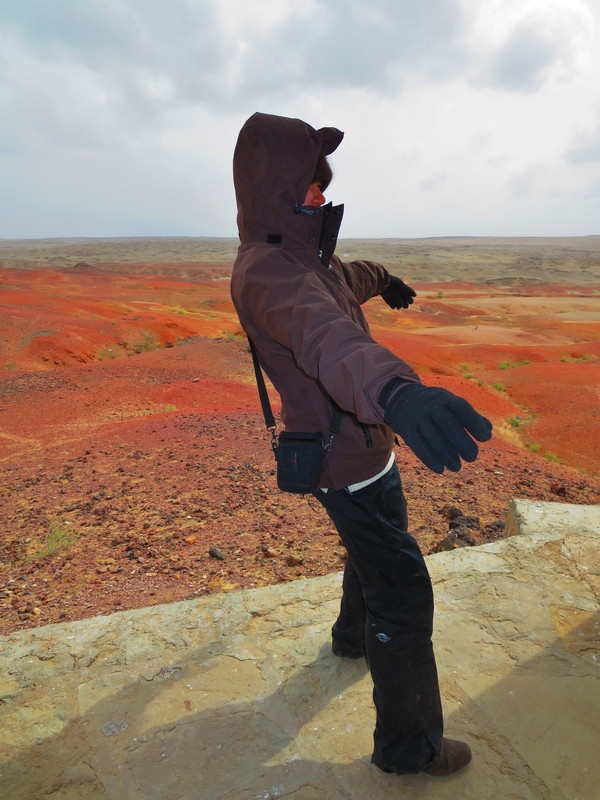 While our guide didn’t speak English, our friends translated for us, revealing he was very knowledgeable! 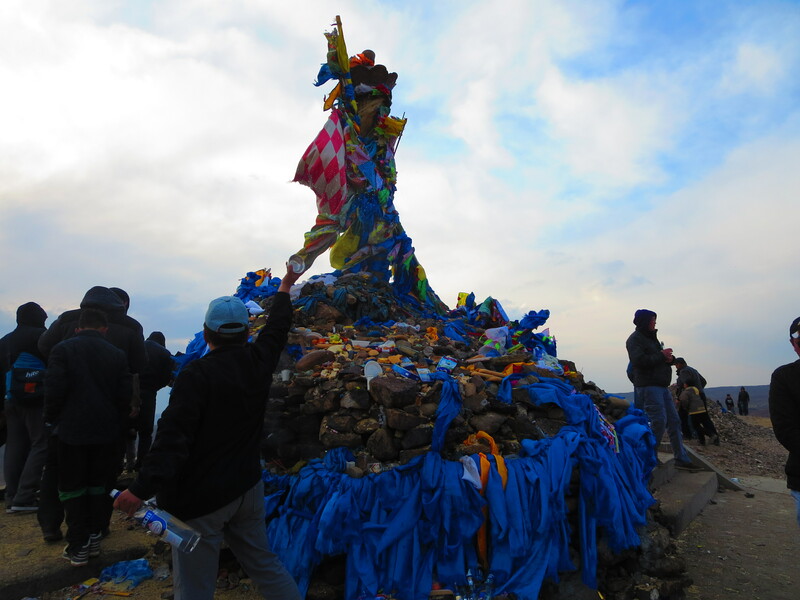 A famous shrine, this nearby monument is especially important for women hoping to become or those already pregnant. This double stupa is intentionally shaped liked gigantic breasts and has been entirely covered in layers of dairy products and vodka. Women make offerings of milk in the windy morning. As you can tell from the large puddle of milk, there were a LOT of women who came to pay their respects that morning. 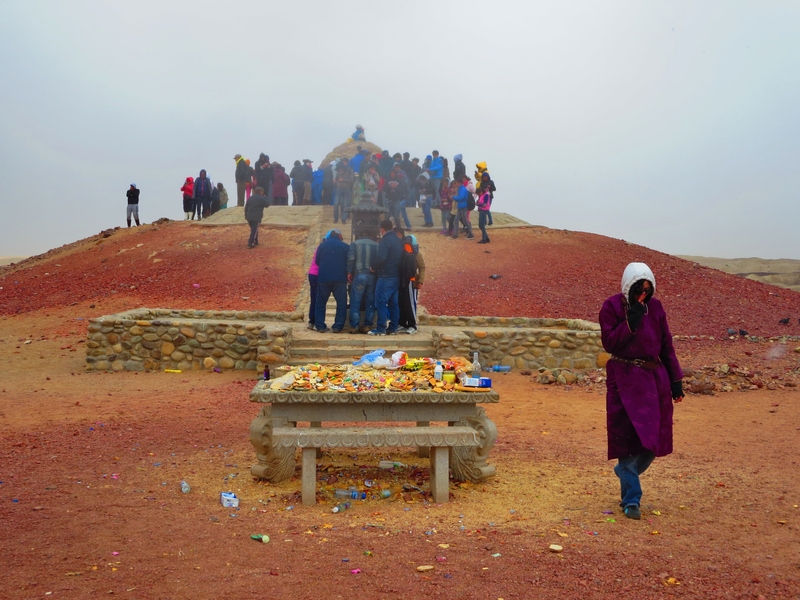 Men are encouraged to circle the shrine three times, but are not allowed to make offerings. Last time I visited three years ago, facilities like trash cans and proper roads were non-existent. 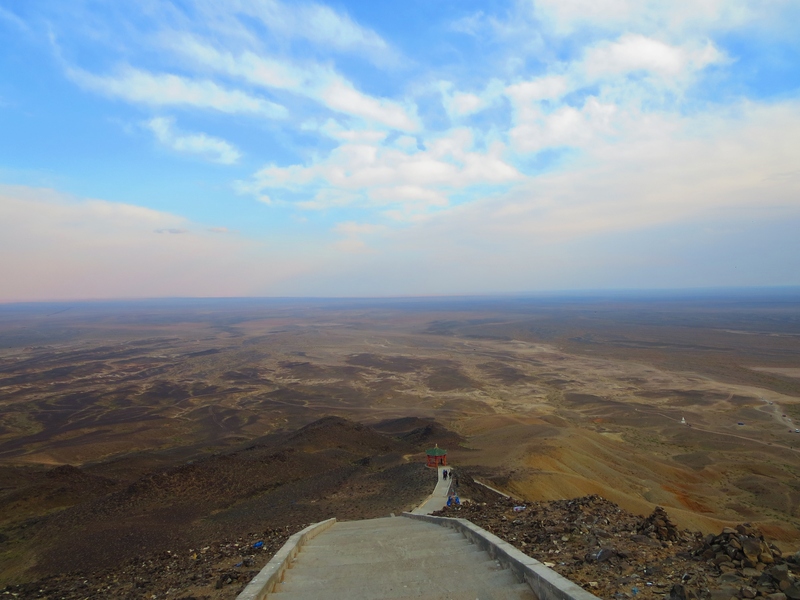 This road connecting various remote sights in the East Gobi was reportedly funded by the United States government as part of a Millennium Challenge Account project, a product of the United Nation’s Millennium Development Goals. It’s made tourism much easier and more comfortable! 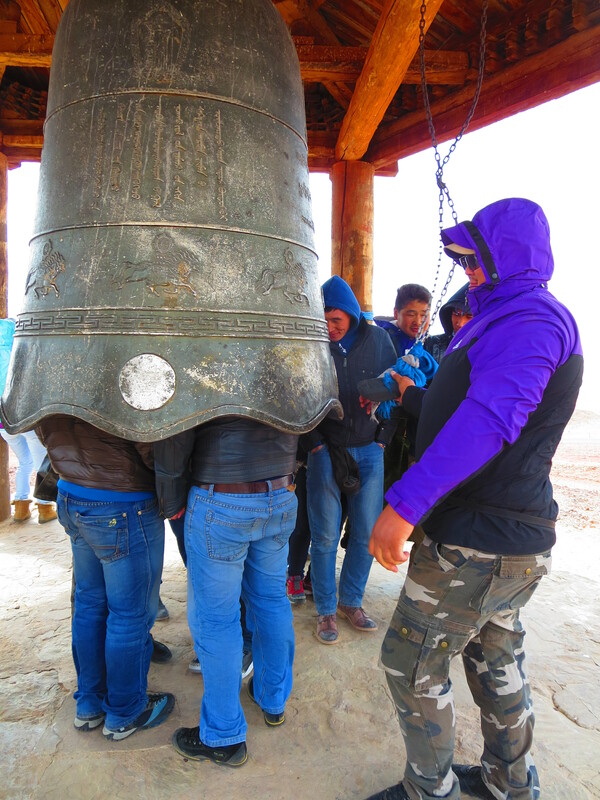 The next stop on our Khamariin Khiid tour: a bell renowned for calling good spirits and energy to the ringers. The best spot for receiving the energy is inside the bell. At first I thought these men were just messing around, but it’s a common ritual! It’s a windy one, especially by the bell! 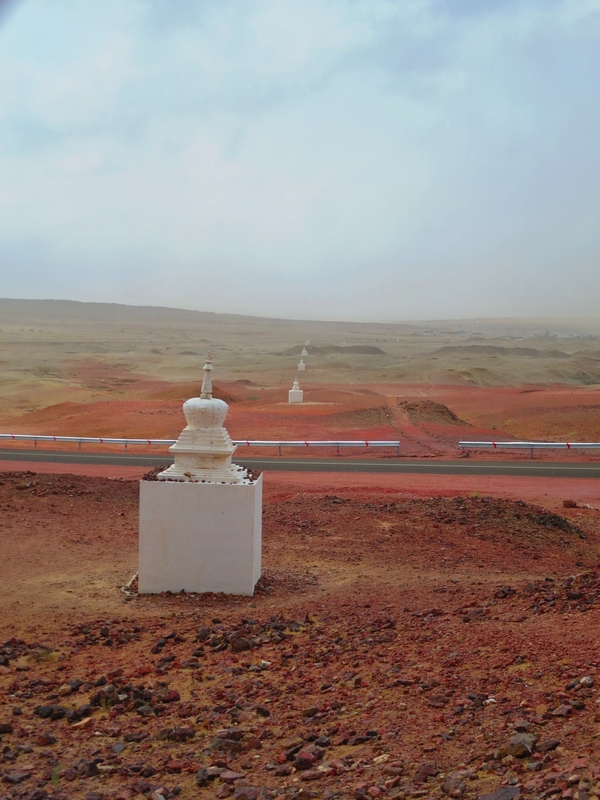 Perhaps the biggest attraction at Khamariin Khiid is a few kilometers down the smooth newly paved road: Shambhala, one of the world’s most-powerful energy centers. 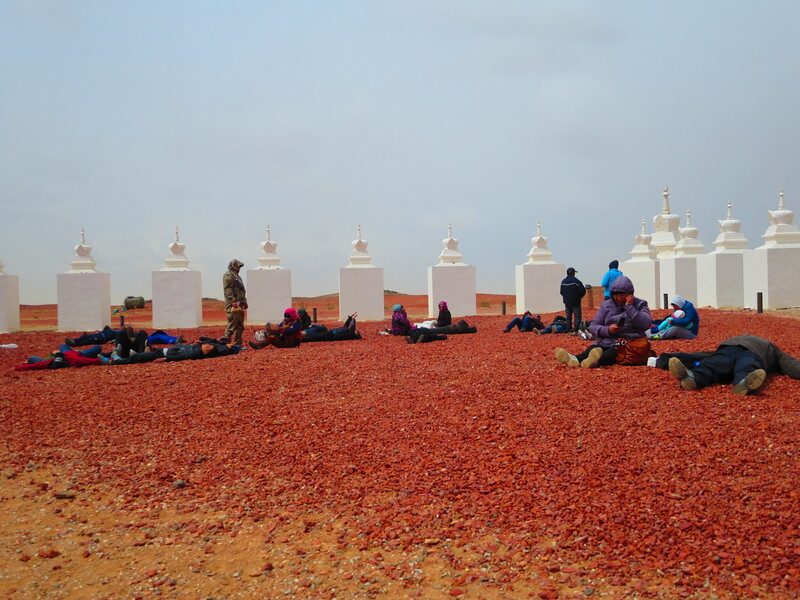 Discovered by monks centuries ago as a site favorable for advancing one’s meditation (and even reaching Enlightenment!) 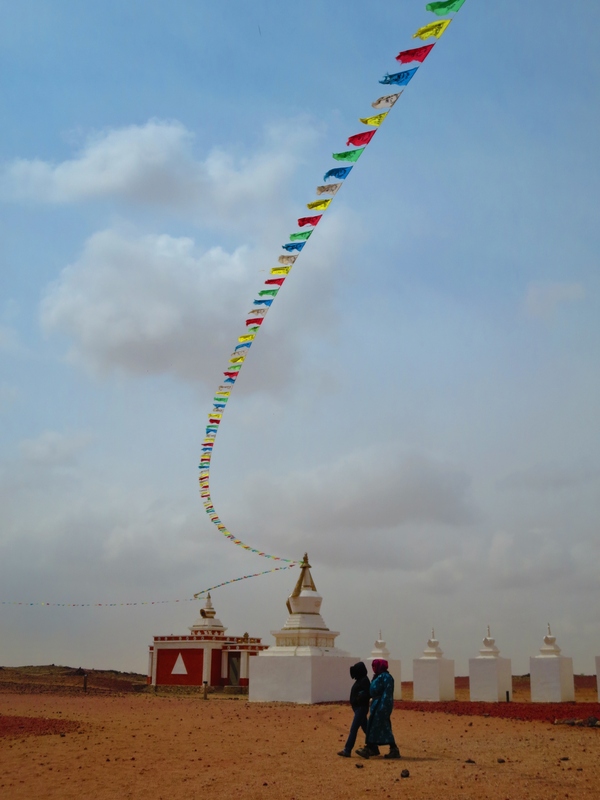 the rectangular park is bordered by stupas and crisscrossed by lines of triangular prayer flags. 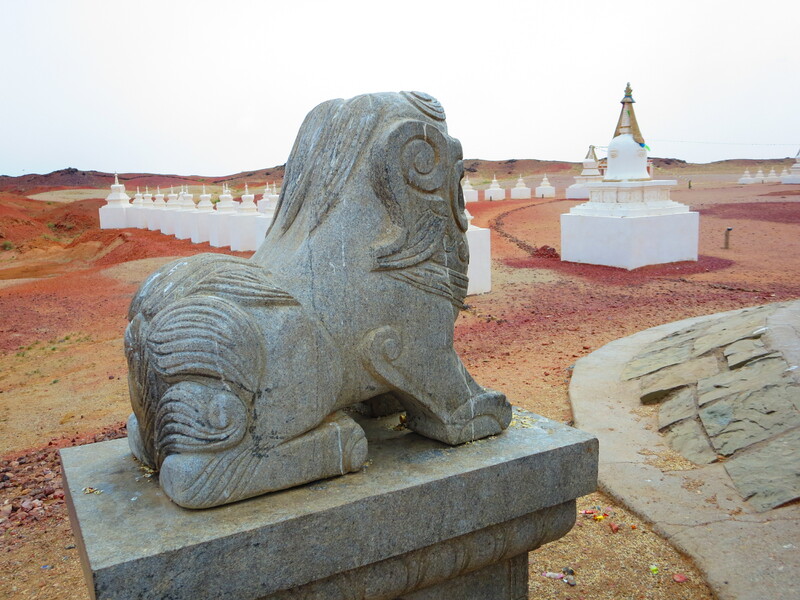 A lion watches guard over the famous clay yard. 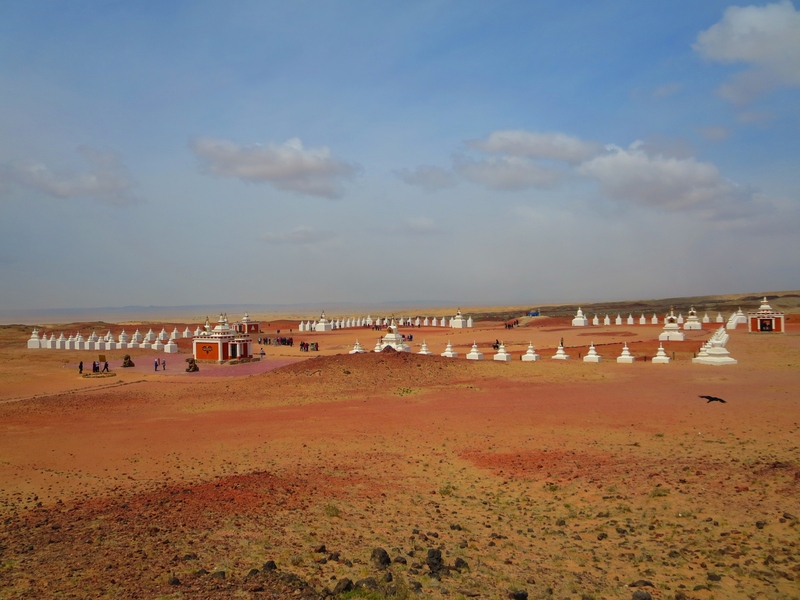 Hundreds of tourists flocked to the site over our weekend, despite its remote location! The view of Shambhala from the far Western edge of the enclosure. A woman approaches the main shrine from the incense offering. The main shrine. 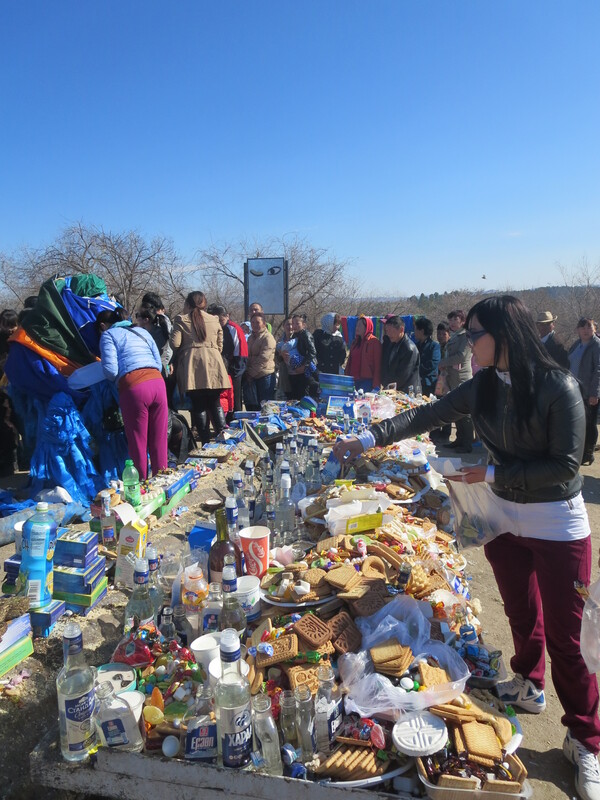 Mongolians gather to sing a sacred incantation carved into a monument nearby and make offerings of vodka, candy, and milk. 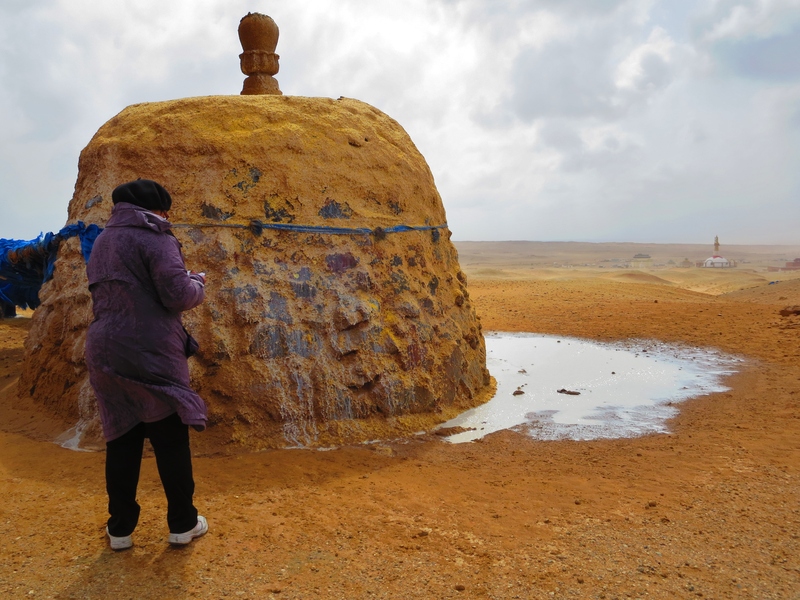 Laying on their backs, Mongolians soak up the natural healthful energy believed to be emanating from the earth itself. I tried it too! Two women cross the yard (one wears a traditional “deel”), walking with the wind at their back! The name “Shambhala” has several layers of meaning. 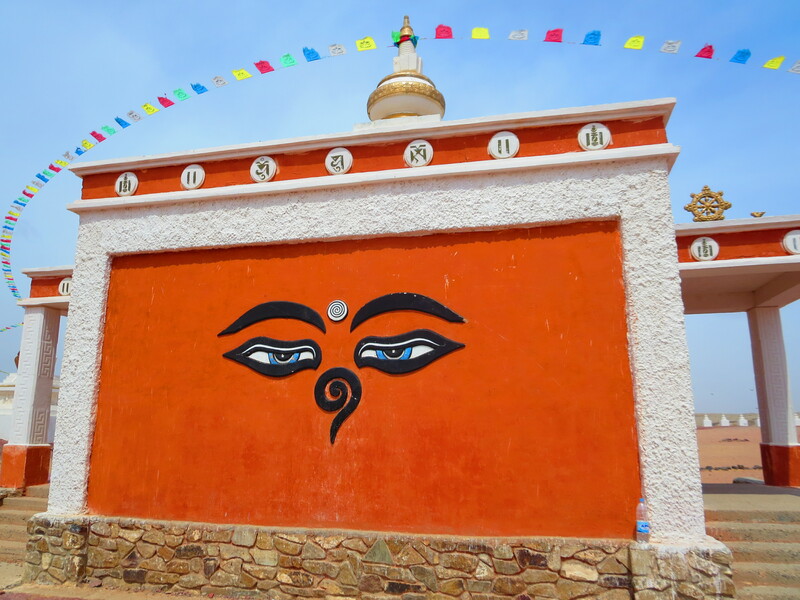 In Tibetan Buddhism and Hinduism, it’s a famous historical (or mythical) kingdom in inner Asia, made popular by the Kalachakra Tantra and the Vishnu Purana. It’s also known as a “Pure Land,” a heaven on earth where all who seek spiritual attainment shall find it. 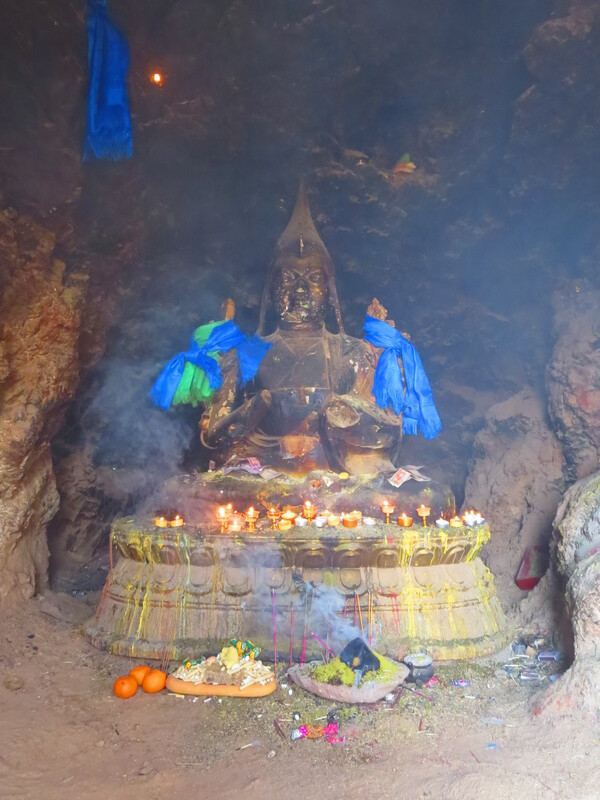 After Shambhala, our guide took us to see the nearby meditation caves where monks and lamas were bricked inside for a total of 108 days while meditating. 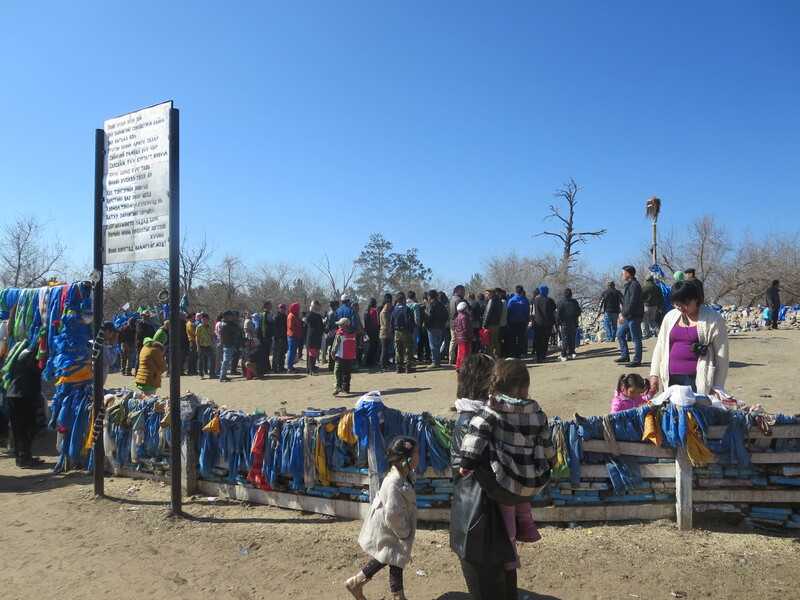 For the first 54, they received a small bowl of food through a single-brick opening. Every day they ground down the bowl three times until it completely crumbled and was useless. At that point, the small opening was sealed and the last 54 days were spent in complete darkness and isolation — without food! After that period, his fellow monks then tore down the wall. If he survived, he was granted a special spiritual status. Not a bad view! Too bad meditators were bricked inside! Brick constructions still remain intact in places. A Buddha statue now sits cross-legged where once a meditator did. Incense and offerings are commonly presented. A tight squeeze; a “birthing canal” through which visitors crawl and are “reborn.” Those who crawl through before and after you are believed to be one’s spiritual brothers and sisters! 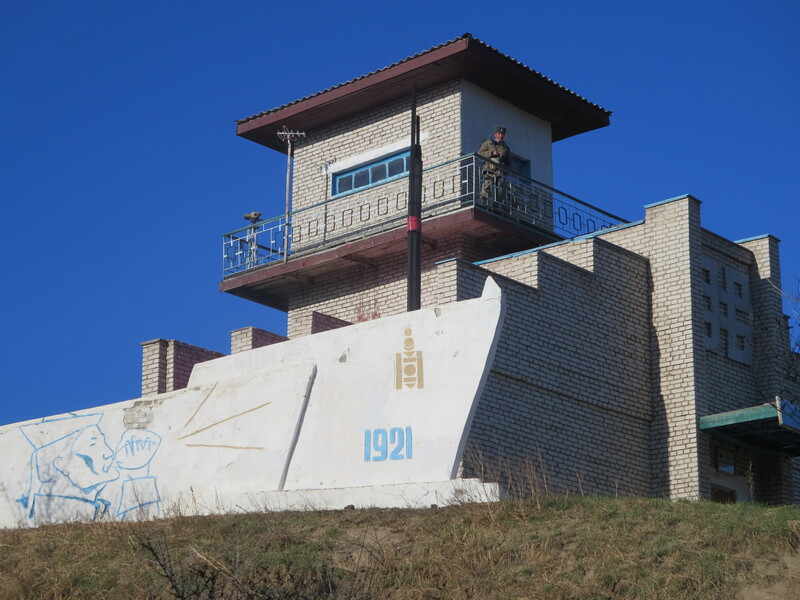 After exploring the caves it was time to return to the ger camp for lunch of buuz, steamed dumplings, with milky tea! 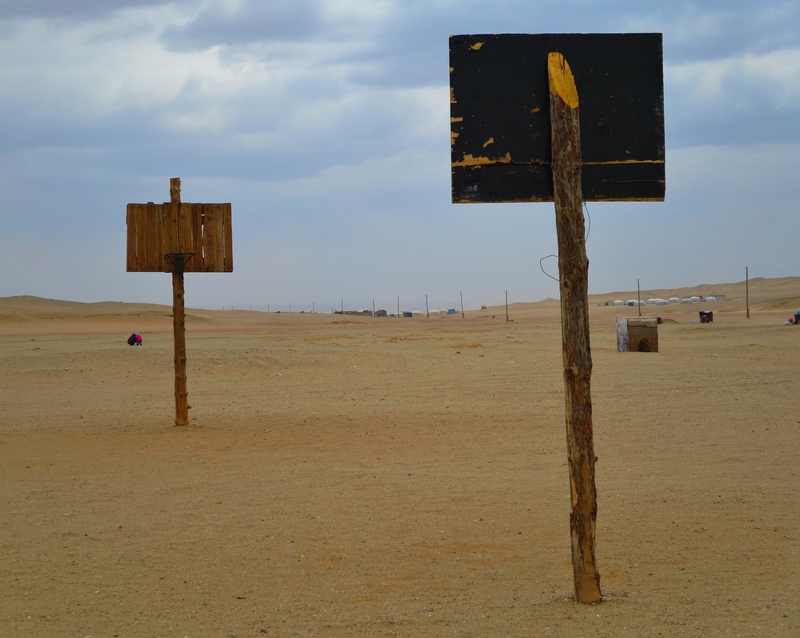 Not much basketball being played today! 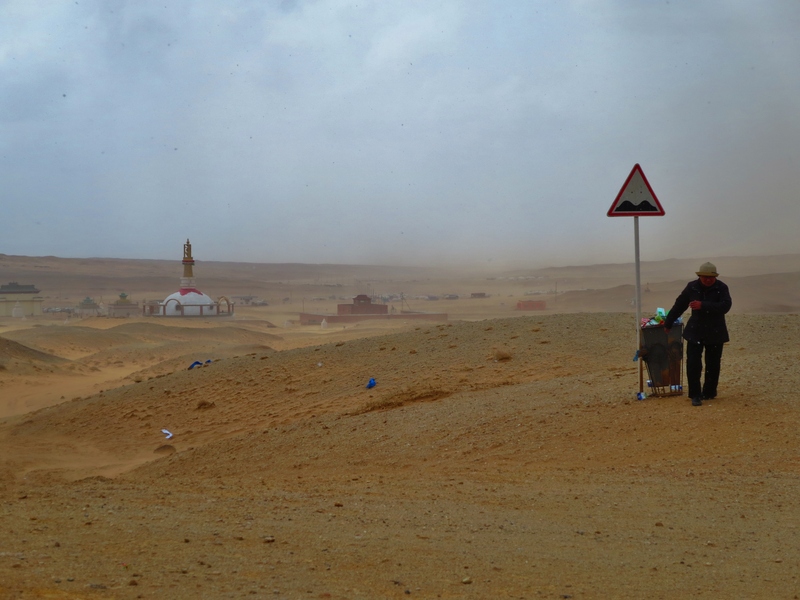 Children play despite the brisk weather and dust! 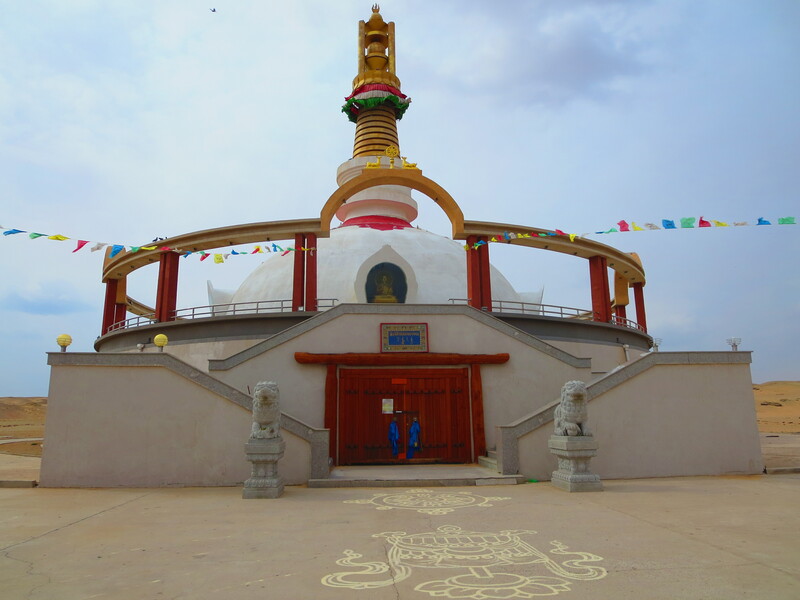 The main stupa houses many intricately carved murals of Buddhist deities. 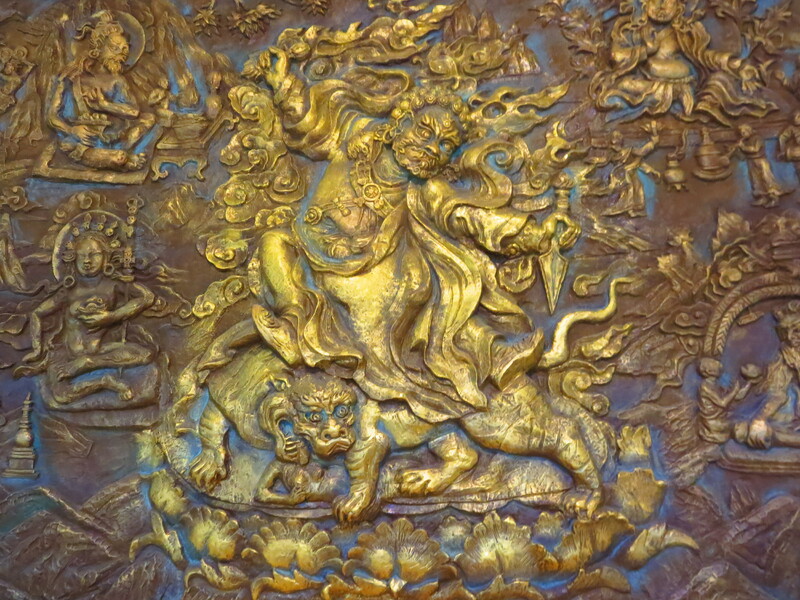 A wrathful deity cast in bronze. Advertisements in front of wishing mountain! The commercialization of this area is amazing. Since my first visit here three years ago it’s remarkable how much things have changed! 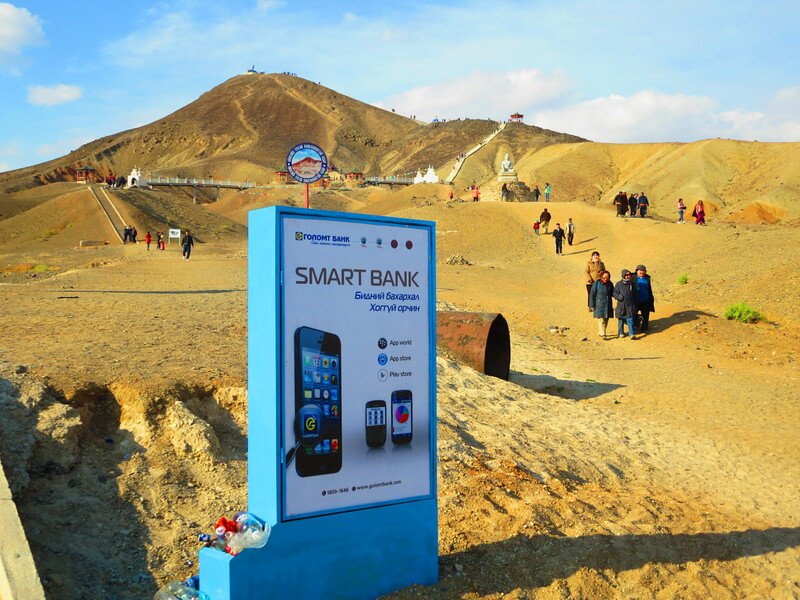 Thanks Xac Bank for sponsoring this timeless pilgrimage site… I guess? Wishing mountain! On the main “mountain,” or hill, only males are allowed at the top. Women and girls must stay at the first lower summit on the right. 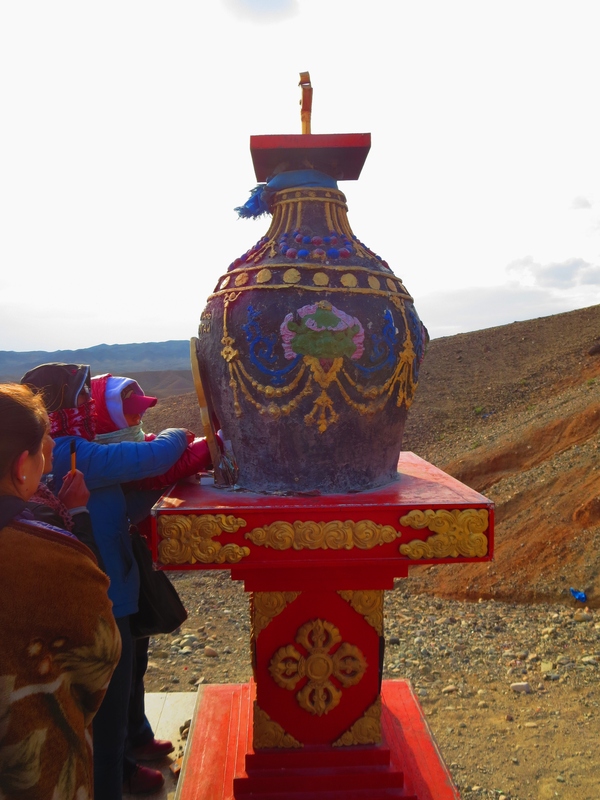 Near the base of the mountain, people write wishes on pieces of paper and burn them in this incense burner in hopes that they will come true! I saw one woman with several full pages of handwriting. She must have had a life-plan! After many steps, I reached the top! 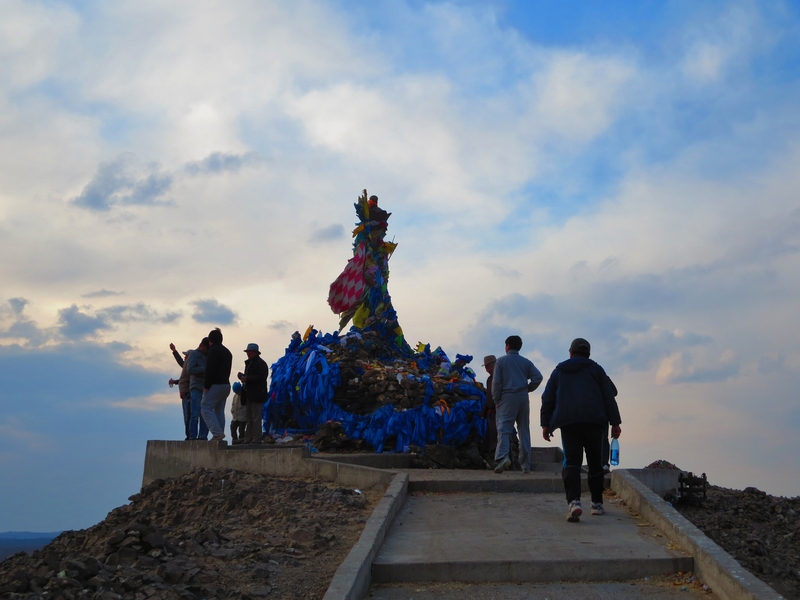 A man makes oblations of vodka at the ovoo, or shrine, on top of wishing mountain. 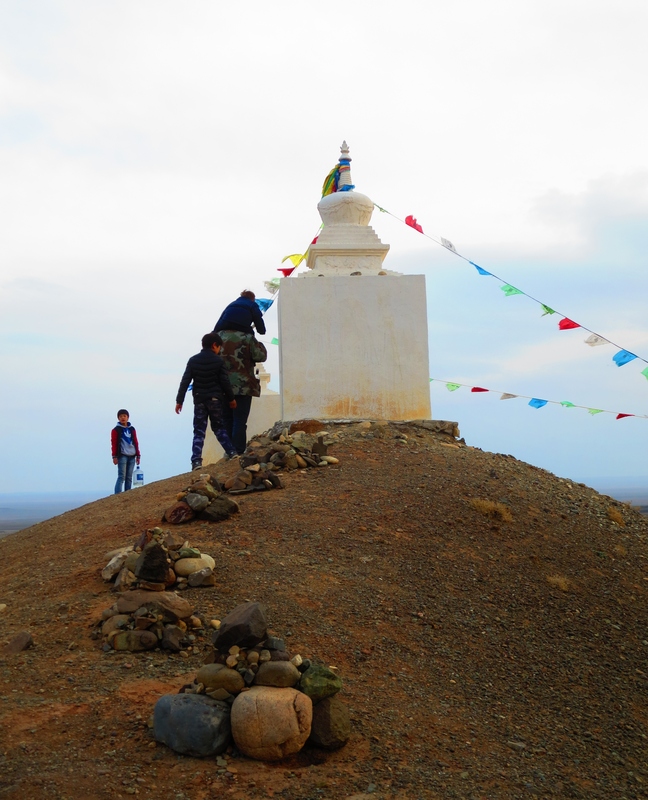 A child on his father’s shoulders aims to place a rock on a stupa. His sibling watches on. After a very busy day at Kharamiin Khiid and the nearby attractions, we returned to the main city of Sainshand to the Danzanravjaa Museum, dedicated to the famous poet, playwright, and lama from Dornogovi province. With personal, religious, and literary artifacts, this museum is a treasure trove of culturally significant items. 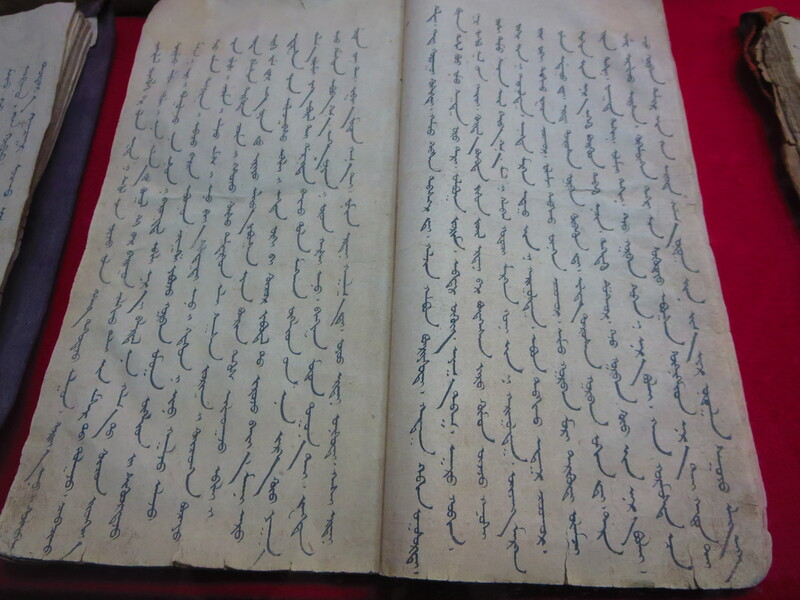 Traditional Mongolian script attributed to Danzanravjaa. We were lucky enough to overlap with a mutual friend of ours, Zahariz Khuzaimah, a well-known National Geographic photographer, documentary film-maker, and adventure touring cyclist. Although we were totally spent after hardly any sleep and a cold windy day of sightseeing, our group greatly enjoyed chatting with Zahariz about his own adventures. He was planning to bike to the nearby Chinese border in the coming days. Check out one of his websites here. Quite the photographer! After dinner our group took the overnight train AGAIN, this time back to Ulaanbaatar. After all the excitement, I slept like a log! While I would recommend staying in a ger overnight to other visitors, the trip was phenomenal! 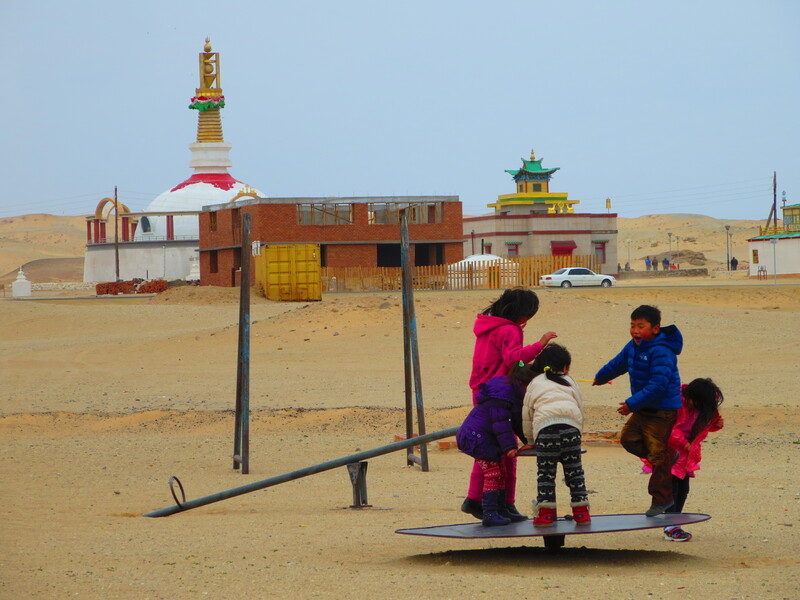 Gallery: Train Ride to the Dornogobi! Leaving Ulaanbaatar and its snowy sprawling ger districts. Springtime is a great season to take trains here because roads often look like this or worse! The signs of industrial development are obvious! While many nomadic herders are settling down on the peripheries of Mongolian cities and settlements, their livestock are often still nearby! Nope! Another reason why I prefer train travel; there’s usually only one way for the driver to go and it’s pretty obvious! The train cars in front of us cast a curvaceous shadow on the scenery as we whiz by! 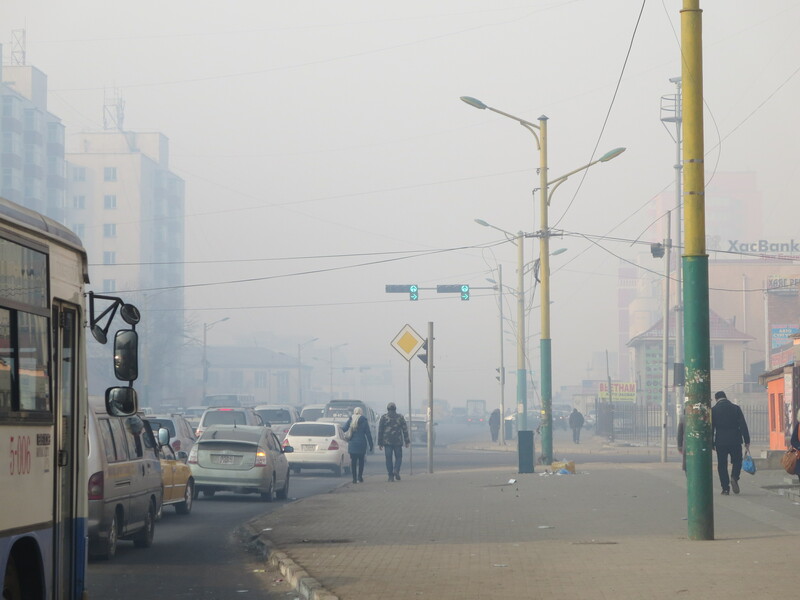 You can almost feel the crisp clean relief from UB smog. Nothing like a few kilos of horse meat to keep warm and enjoy the scenery with a full stomach! More than a fair trade for half a flask of whisky. 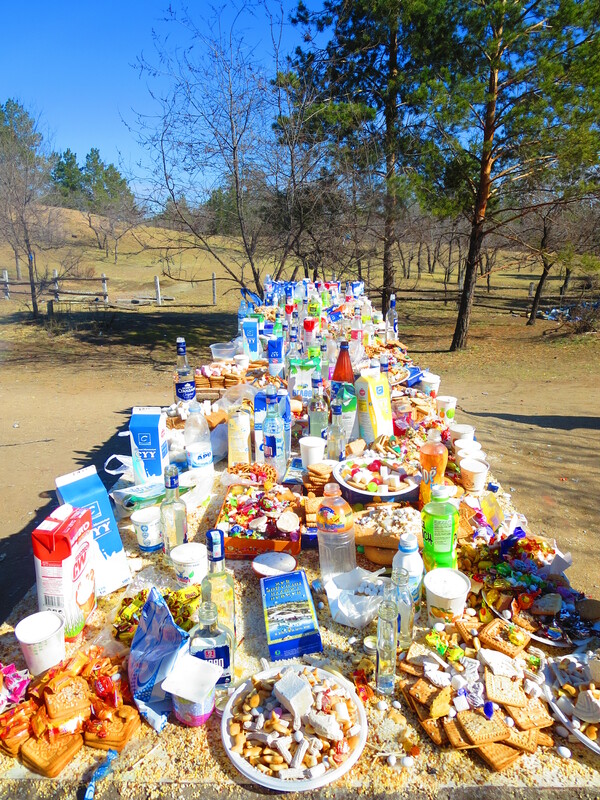 This man and his friends had about 30 kilos from the looks of it! 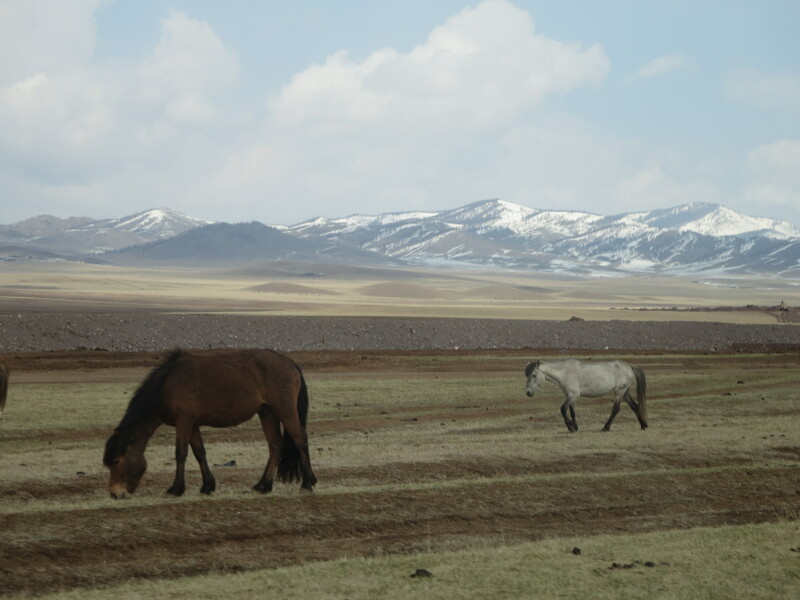 Amazing the sights you can see on a single train ride in Mongolia! 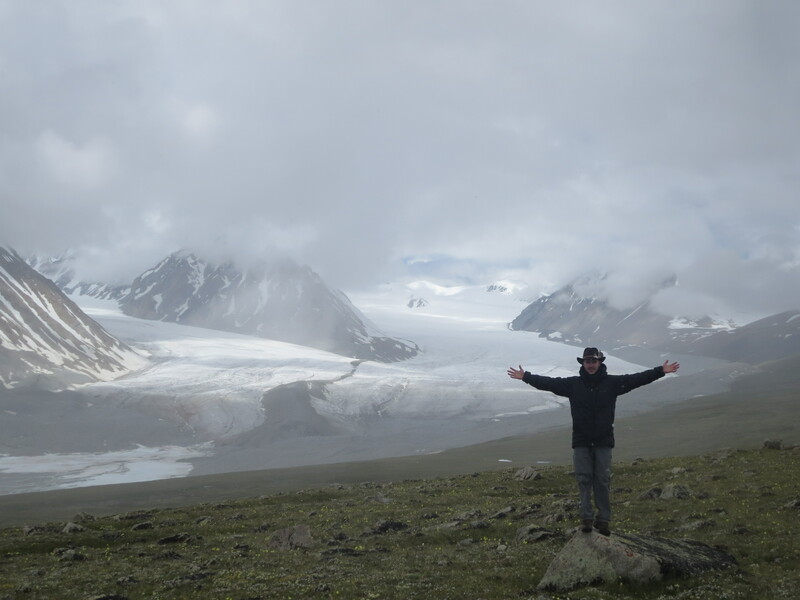 Stay tuned for the next installment from this trip featuring my day of adventures in Dornogovi aimag. 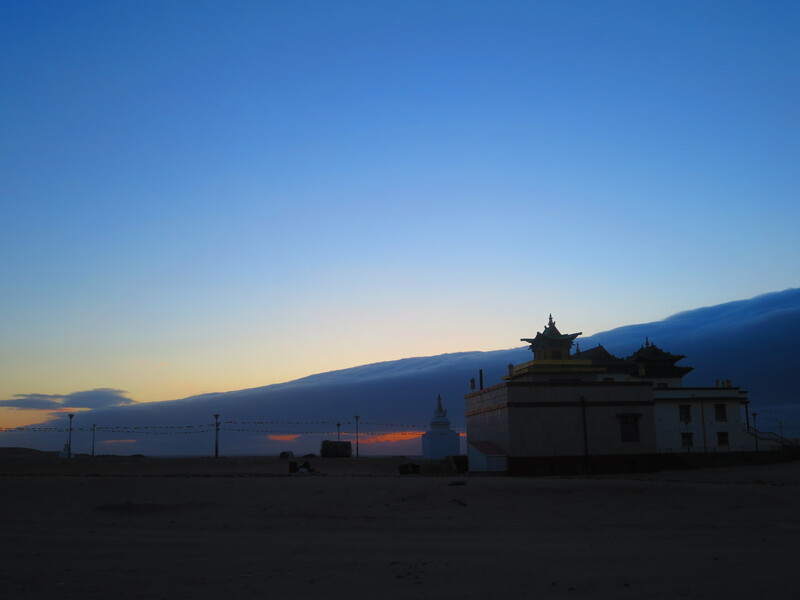 It’s main city, Sainshand, is nearby the Gobi’s most famous energy center, a wishing mountain, meditation caves, and more! 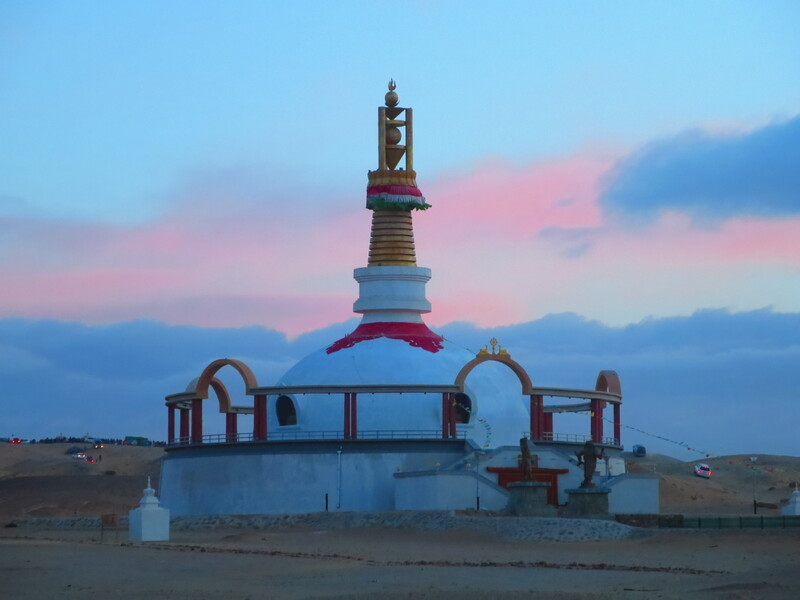 Sunrise behind a massive Buddhist stupa. This monument also houses a museum of religious iconography. 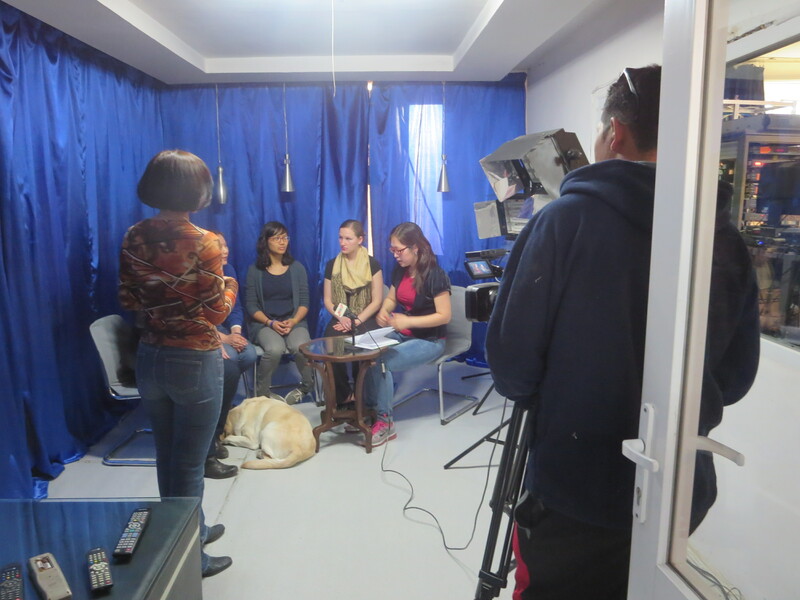 I currently teach general and professional English at a vocational school in Ulaanbaatar to aspiring painters, secretaries, graphic designers, and tour guides. As I quickly learned, vocational English programs require a degree of specialization not found in most other secondary and tertiary educational contexts. Regardless of the type of program, vocational students need not only practical English vocabulary for their field but also a working knowledge of industry-specific skills, norms, trends, and best practices necessary for their profession. My students give a short presentation to their peers using a poster-sized picture. 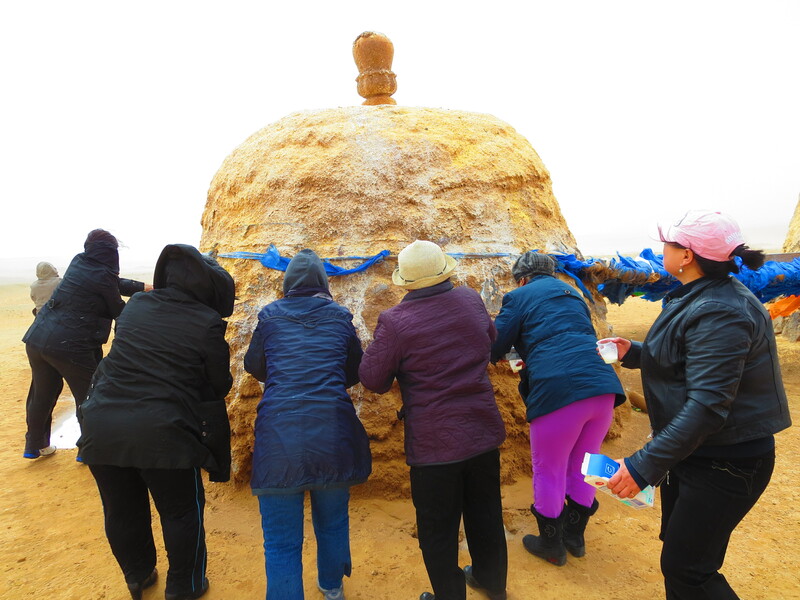 These are lofty goals for educators in vocational institutions but ensuring they are met is vital to the future of Mongolia’s economic growth. 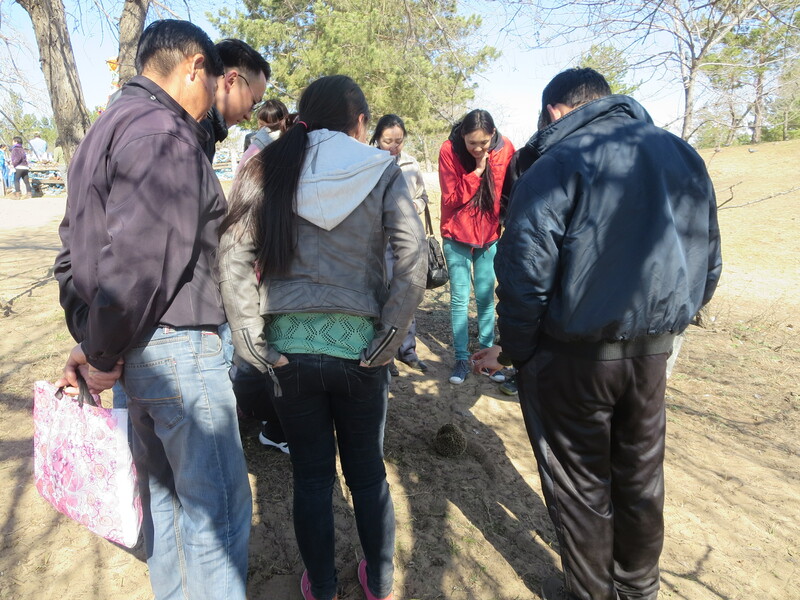 Drawing from my personal experiences, this post will address universal difficulties facing technical English programs, survey issues in the field of vocational education as a whole, and offer suggestions for making Mongolia’s technical and vocational education system as strong as possible. The class watches a student presentation in my English club. Teaching vocational English is a difficult but worthwhile undertaking. Students are often not familiar or comfortable with concepts, vocabulary, and background knowledge of their subject in their native language upon the start of their programs. This is only natural considering many pupils do not have extensive real-life experience within their fields prior to enrollment. However, this adds a challenge for educators. Unlike general English programs that typically begin with elementary-level ideas and vocabulary, most of which students easily identify from comparable words in their native language, in technical programs students do not necessarily possess a strong basis for learning relevant English terms. Further, not all pupils entering technical schools have a thorough grasp of elementary English grammar, vocabulary, or pronunciation. Conversational English speaking ability can be very low and student motivation is at times a problem. Nevertheless, it’s imperative for all students to understand the importance of mastering English relevant to their field. 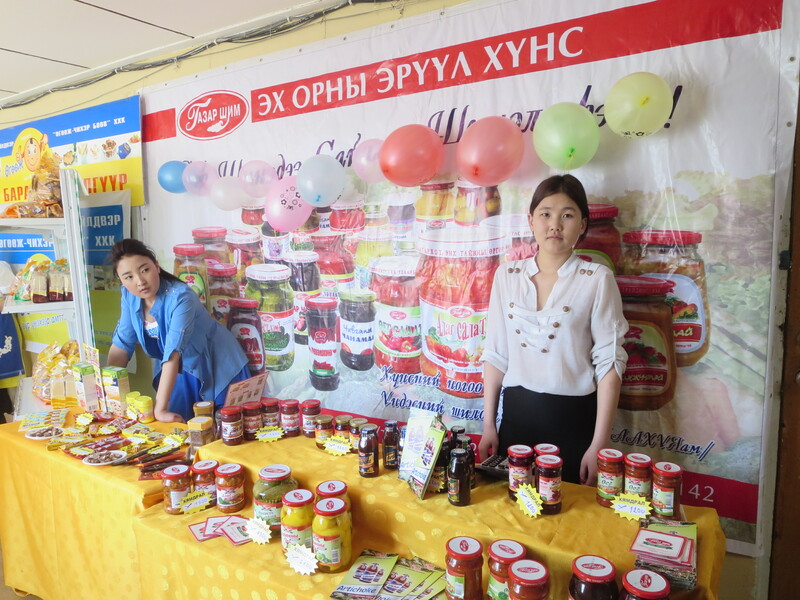 It doesn’t matter the profession in which a student is interested, in the modern global economy customers, clients, investors, managers, business owners, and colleagues in Mongolia are more likely than ever to speak English as a first or second language. Possessing the adequate skills to communicate with people in a workplace setting is invaluable. Further, in order to perform at a high level and continue to develop professionally, workers in all industries should consult up-to-date resources. Many of these materials are only available in English which leave non-speakers and non-readers behind. Unfortunately, educational institutions all over the world are struggling to provide vocational students with practical skills to make them employable — and not just English skills. There are several reasons for this. First, too many higher education institutions, especially those I’ve visited in Asia, continue to use dry and outdated methods of English instruction. Reading, translation, and rote repetition of texts is not an effective strategy and leaves students bored and unmotivated. 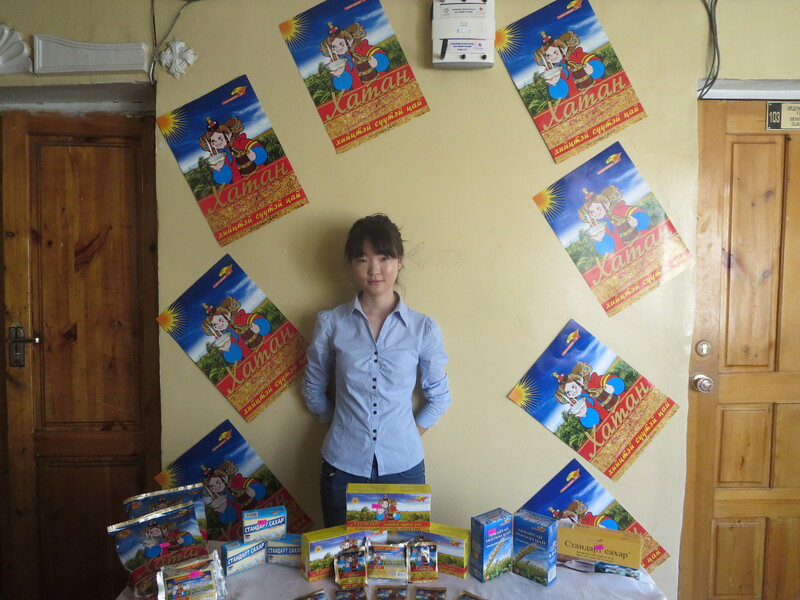 A student bashfully operates her display at the school marketing fair. This is a great example of a hands-on way to actively engage students in what they’re studying and provide real-world skills! Other students at the marketing fair patiently wait for potential customers at their tables. Instead, methods should be made more dynamic and include activities aimed at increasing the production of spoken English related to the tasks pupils will be performing in a real life environment. Always popular among my students, games and competitions should be incorporated into the classroom on a daily basis to keep students’ attention and increase retention of knowledge. Also, field trips, hands-on seminars, and workshops should be used to supplement students’ English knowledge of their disciplines in a setting that replicates their real-life work environment. Today, I’m going to an art gallery with my art 101 students! Two creative hair design students from my school ready their models at the National Golden Scissors event. Both won medals! 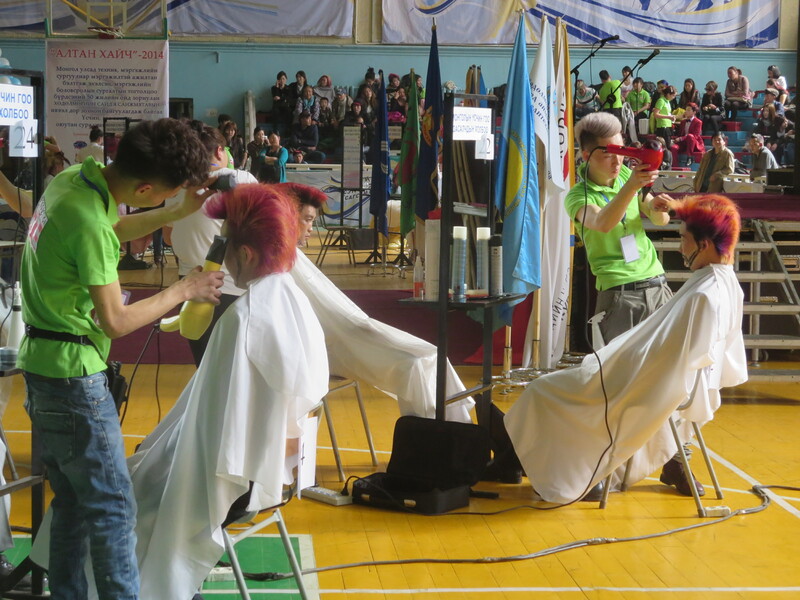 Competitions are great ways to motivate students and schools to excel! 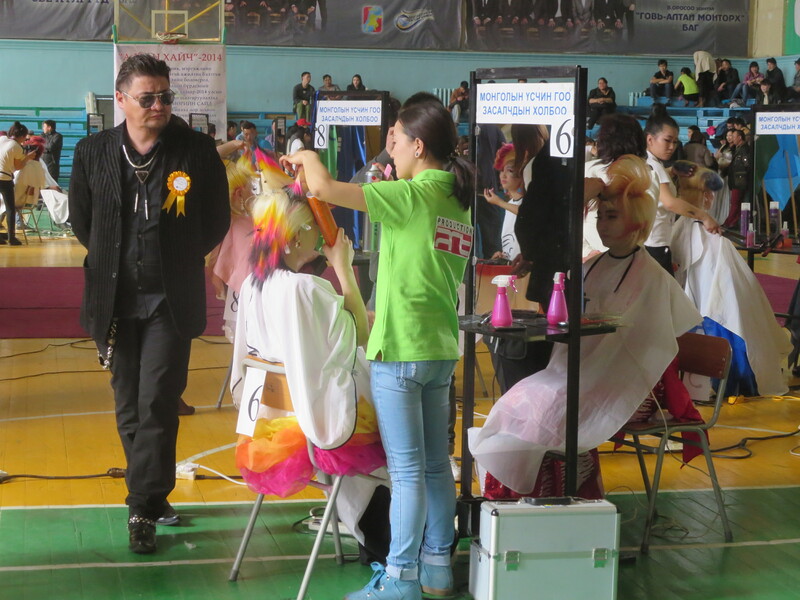 Judges inspect the students’ creative hair creations! Judges examine student models’ nails at the competition. A second major problem with vocational institutions is that many schools lack sufficient communication with professional organizations, ministries, and companies within their fields. This is the case in Mongolia but it’s not unique in that regard! The result is, no matter how hard students work, they’re not being adequately prepared for a real workplace environment, leading to poor employment prospects. Many students have little faith they are gaining relevant or employable skills, which further demotivates them. Curricula must be designed in coordination with industry leaders to guarantee that the skills-focus, English vocabulary, and methodologies of instruction are up-to-date, relevant, and effective. Globally, as well as within Mongolia, government ministries of education and labor should do more to foster business-education partnerships. Larger tax breaks should be given to businesses that engage in collaboration with vocational schools and existing deductions should be made more widely known. Ongoing partnerships should be better publicized by all parties to encourage further networking between industry and vocational schools. 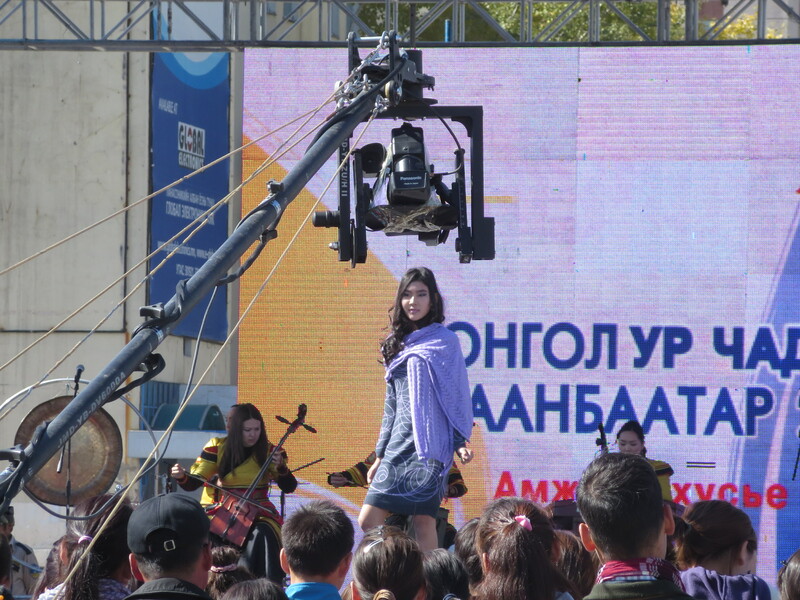 The Ministry of Labor sponsors a yearly exhibition of vocational schools, a great example of collaboration between government and educational institutions. This demonstration of student skill centered on the tiny display table! 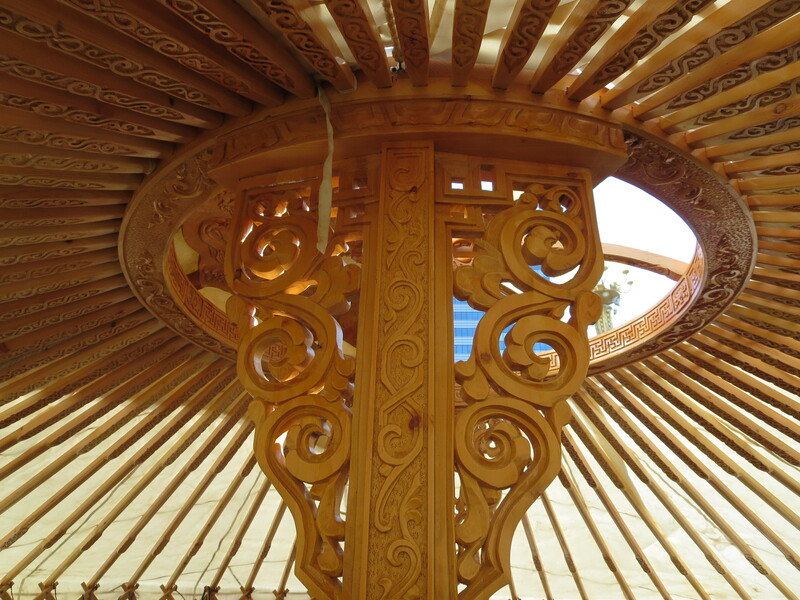 Intricate ger carving and woodworking . 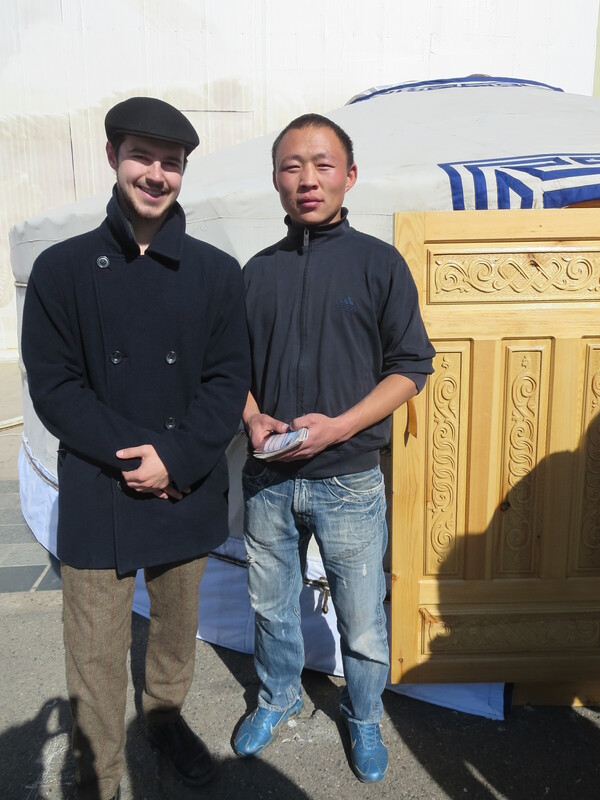 Me and the apprentice responsible for this incredible craftsmanship! Furthermore, student internships and apprenticeships should be required for graduates of all high-quality programs and institutions. I’m very pleased with my school’s summer internship program for hospitality students who gain real-world skills as hotel staff each year. Opportunities for practical experience should be facilitated by every vocational school. Emphasis should be placed on opportunities where pupils can practice both professional and English-language skills. It’s impossible for students to be employable upon graduation if they have no work experience or training. Databases should be made of hired graduates from every department in a vocational or technical institution to assess the employability of students. Schools could then use this information to find opportunities for further internship placements and partnerships. Importantly, this employment information should also be required of every vocational school by the Ministry of Labor in order to better assess the needs of the labor market. 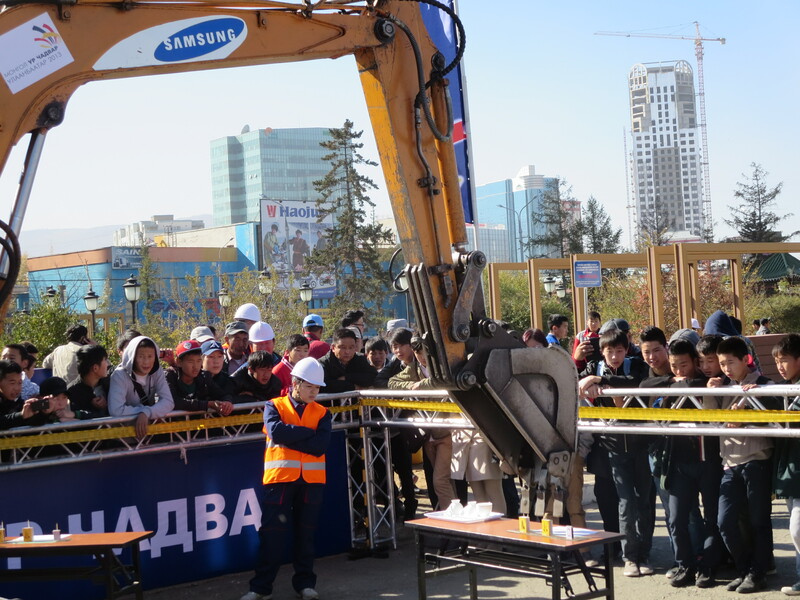 With sufficient information, Mongolia’s Ministry of Labor could more effectively guide its vocational and technical education system to supply the correct number of graduates to meet the current demand for jobs in each economic sector. 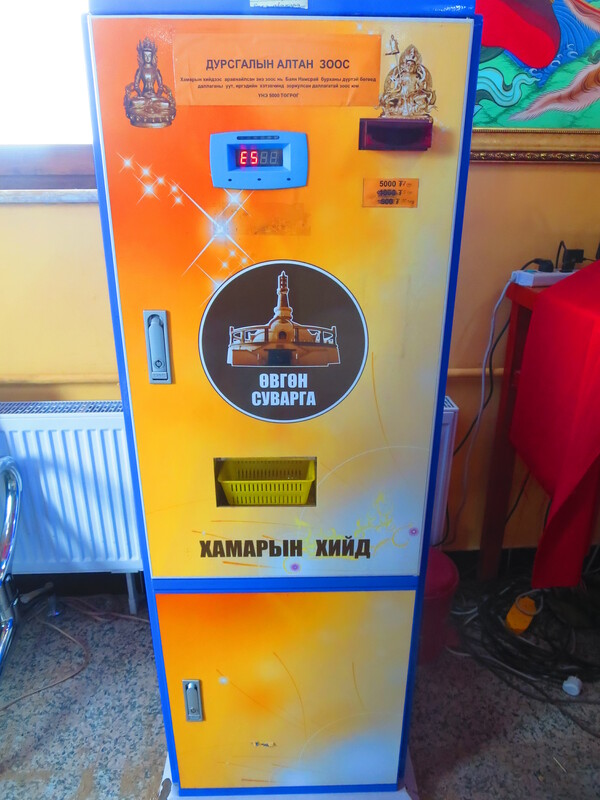 This could benefit not just students and vocational and technical schools but Mongolia’s entire economy! The performing arts programs at my school are fantastic and, of course, some students go on to be professional performers. However, when schools invest disproportionately in programs like this that have relatively low rates of employment after graduation it prevents the efficient allocation of labor. Particularly in a developing country, the opportunity cost of these decisions can be high. Why have massive programs for auto workers when there are not enough factory jobs for all the trained graduates? Why have small or non-existent programs for construction and mining when there is still a large demand for workers in these sectors? Sadly, some companies are not currently able to meet their needs for skilled workers domestically and may instead hire better-trained but more expensive foreign employees. With statistics on student success the Ministry of Labor could then provide incentives for schools to expand programs in sectors of strong economic growth and cut programs that waste valuable tax dollars as well as students’ and instructors’ time. These changes are difficult but necessary to ensuring both the immediate and long-term success of Mongolia’s economy. A model shows off a student designer’s work at the National Vocational School Expo’s fashion show! A model poses for the camera as a crowd takes in the fashion design students’ best work! There‘s much to be done to improve vocational English and technical educational systems to the point where both graduates and businesses are reaching their full potential. 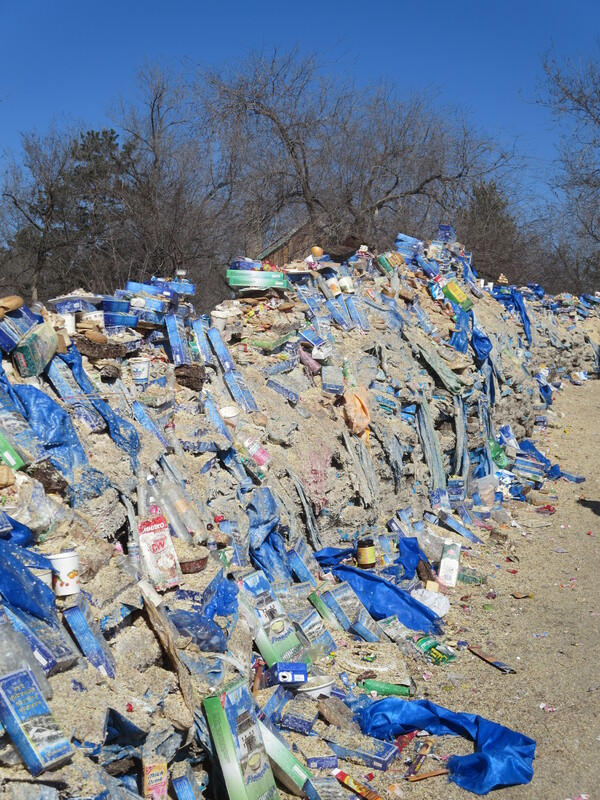 Most of these issues are not specific to Mongolia but also found in many other countries, including the United States. However, there are many causes for hope! My students work very hard and many show a very high aptitude for learning English as well as learning vocational skills. 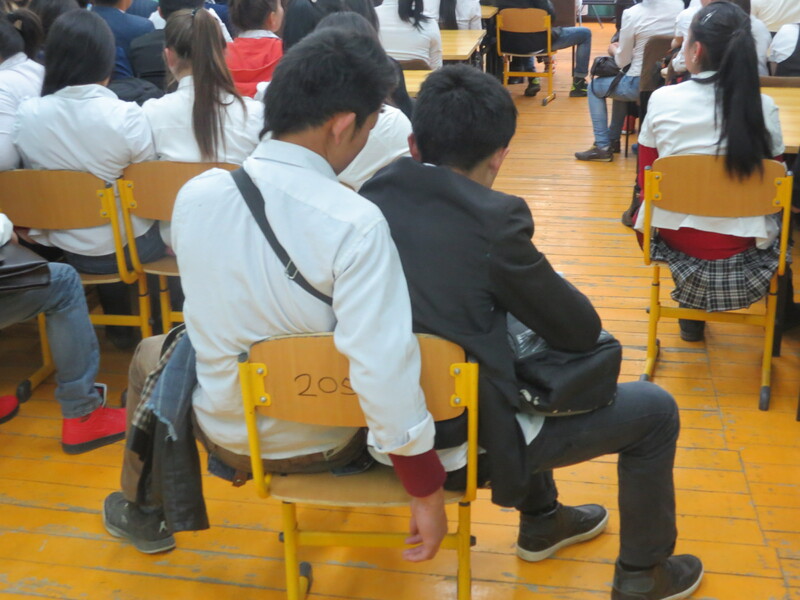 If educational administrators, government representatives, and business leaders convene to discuss these critical issues, and consider policy changes, Mongolian vocational students will have an even brighter future! 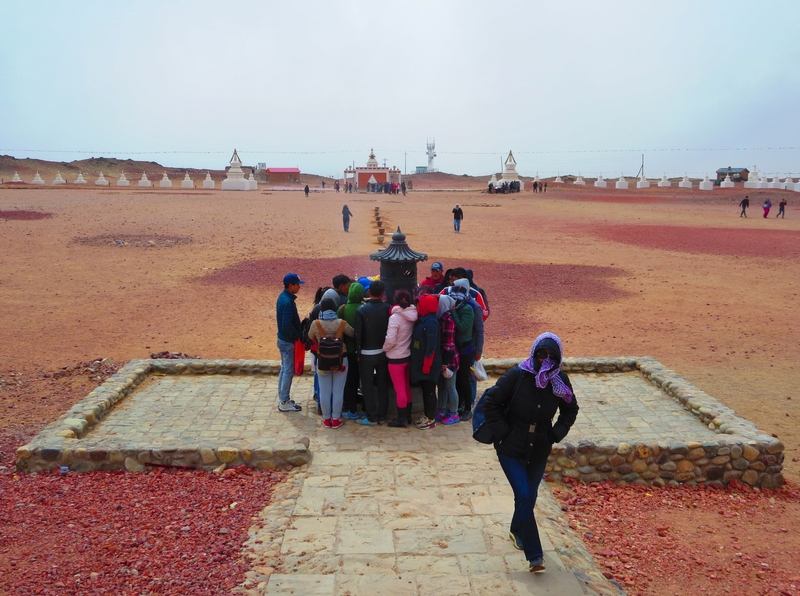 English tour guide students show me around Ulaanbaatar on a field trip! *Note: This article was published by the UB Post on May 30th, 2014 as an “Opinion” piece. Thanks for those of you who supported A Nomadic State of Mind. I'm currently working on rewards for my backers but look forward to publishing new posts soon! Please contact me at pjbitt21@gmail.com! The views expressed on this website are not those of the Fulbright Program, US Embassy, or any local affiliates but those of the author.